Is Your Tucson Home Flooding from the Inside? Whether you plan on staying in your Tucson home for many years to come or you plan to sell your Tucson home; it’s always a good idea to continually keep up with maintenance and improve your home each year. Not only are improvements necessary to keep your home in check, but maintenance is necessary to ensure it is functioning properly to not cost you extensive repairs costs down the line. So, what is the biggest threat to our homes? Water. More American homes are flooding from the inside. Data show claims for water damage from inside leaks have surged while other types of claims have fallen. Old pipes and valves, worn-out hoses on second-story washing machines and faulty connections for a proliferation of water-using appliances are causing a surge in increasingly expensive damage reported to insurers. The increase has occurred even as many other types of claims—including fire—have declined in frequency, according to industry figures. According to the WSJ.com, one in 50 homeowners filed a water-damage claim each year between 2013 and 2017, the latest data analyzed by Verisk Analytics ’ ISO insurance-analytics unit. It crunches industry data on a five-year rolling basis. The 2.05% frequency rate is up from 1.44% annually between 2005 and 2009. The bottom line is a $13 billion water-damage bill for homeowners’ insurance companies in 2017. Claims average about $10,000, ISO says. Water damage can strike a home quickly or creep up gradually over time. Here are some things experts recommend to prevent it. Roof and attic: Missing, worn or broken roofing material may allow water to penetrate. Attic should be properly ventilated. Kitchen and laundry room: Inspect water supply hoses for appliances like dishwashers, refrigerators, icemakers, garbage disposals and washing machines. When you are ready to buy or sell your Tucson, AZ home, contact an experienced Tucson, AZ Real Estate agent. I'm committed to providing you with the highest quality service. You deserve to have all the latest market information and the very best advice, both of which I can provide you with. I hope to speak with you soon! Limit idle-energy from appliances with smart outlets. As a Tucson, AZ Real Estate agent, my services extend well beyond helping buyers and sellers through their transactions. I specialize in 55+ communities in the Tucson, AZ area and would love to help you find the home of your dreams, just perfect for your retirement. 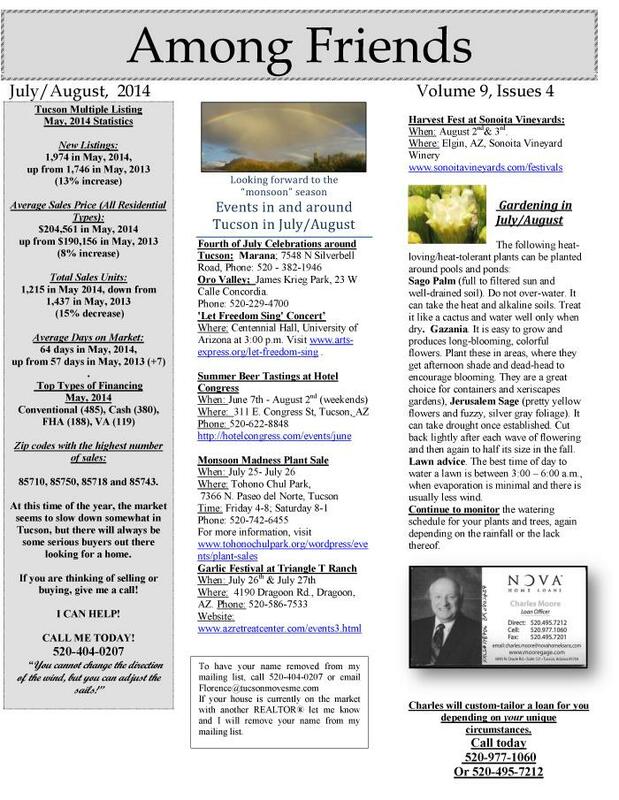 Please contact a Tucson, AZ real estate agent if you are buying a home in the Tucson area. I look forward to hearing from you! 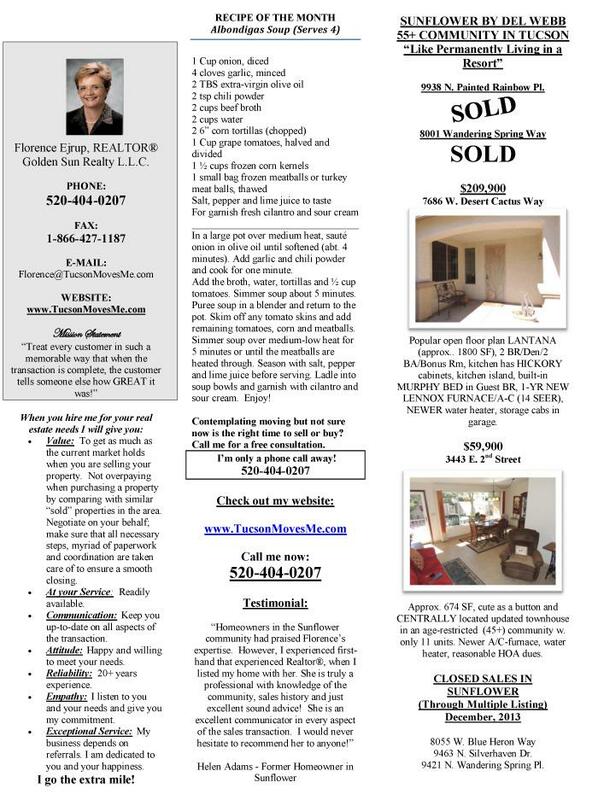 Are you in the market to sell your Tucson home? While it’s true that Winter is a slower real estate season, it doesn’t mean you shouldn’t consider now as an option to sell. 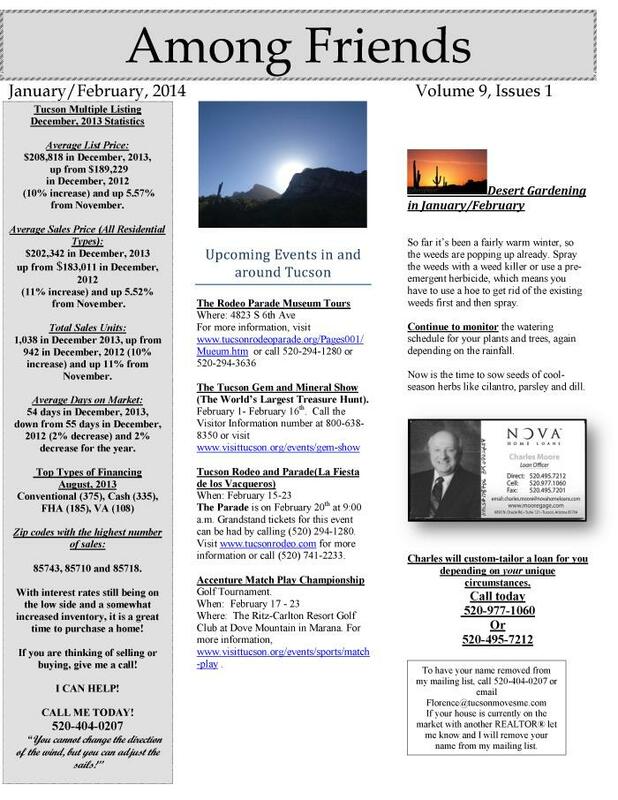 The Tucson Association of REALTORS just released the stats from November. While the market has slowed down a touch, it is still a great time for Tucson real estate! Historically the market is doing quite well, plus mortgage rates are still low enough to encourage Tucson homebuyers. There is no reason to delay in selling your Tucson home. Here are the main points from their latest report. Total sales volume is up 5.31% year-over-year in November as median sales price reached $219,000 for the first time since 2007. REALTORS helped sellers get almost 98% of their asking price in November! Pending sales were 1,464 at the end of November, a decrease of 4.38% from November 2017 and down 5.67% from October 2018. The average home took 38 days to sell in November, 3 days less than October. If you have been on the fence as to whether you should sell your Tucson home, now is a great time! When you are ready, contact an experienced Tucson, AZ Real Estate agent. I'm committed to providing you with the highest quality service. You deserve to have all the latest market information and the very best advice, both of which I can provide you with. I hope to speak with you soon! Retirees, the self-employed and many others often find themselves in a fix when mortgage shopping for their Tucson home -- they are asset rich and income poor. Without a steady income, how do they qualify for a loan? It's not impossible, though the requirements can be stringent. Loans backed by Fannie Mae and Freddie Mac -- which means most loans issued these days -- can use assets such as IRAs and 401(k)s to help applicants meet income requirements. Treating Distributions as Income: One option treats ongoing distributions from IRAs, 401(k) accounts and similar funds as income that's acceptable for home mortgage applications, provided the withdrawals plus other income are adequate to amortize the loan and are likely to continue for at least the next three years. Retirement Account Balances as Income: The second option is designed for people who have retirement funds that haven't been used yet. 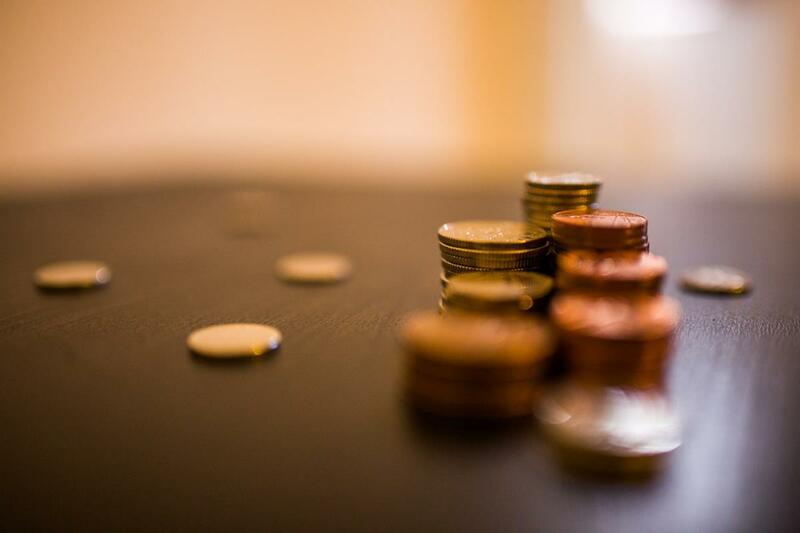 Loan officers can use retirement-account balances as the basis for what functions essentially as imputed income money that is or will be available to the borrower to supplement regular monthly income when needed to make repayments on the loan. So, if you are retired with assets but no income, don’t fret, you can very likely finance that Tucson 55+ home of your dreams! Tucson, AZ has been one of the fastest growing communities in the country for a long time, and with good reason – the relaxed, western flavor and year-round outdoor life make it a wonderful place to live. It's no wonder Tucson, AZ is a top retirement city, it's warm in the winter, has sunshine year round, gorgeous surroundings, and ample space. As a Tucson, AZ Real Estate agent, my services extend well beyond helping buyers and sellers through their transactions. 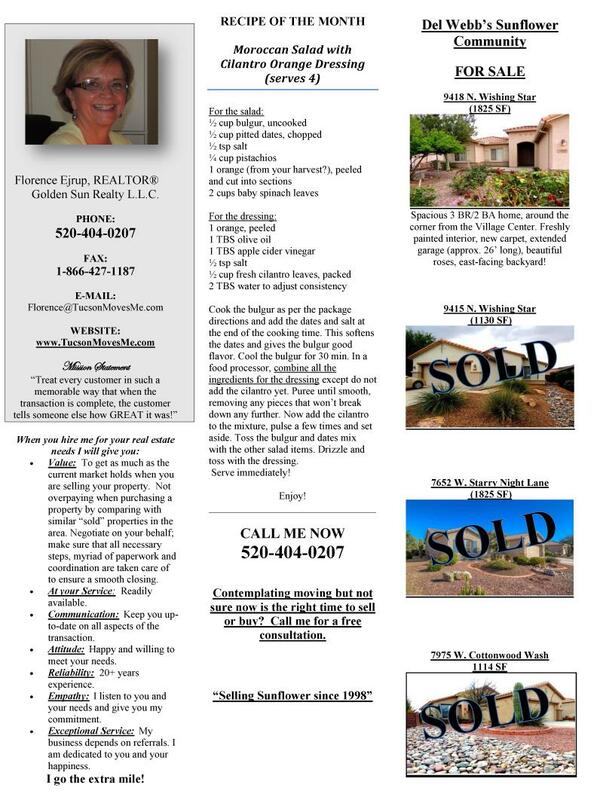 I specialize in 55+ communities in the Tucson, AZ area and would love to help you find the home of your dreams. Please contact a Tucson, AZ real estate agent if you are buying a home in the Tucson area. I look forward to hearing from you! Then you're possibly planning to add new furniture, install a fire pit, and maybe set up a big-screen TV on the patio as well; according to a recent online survey of homeowners by Houzz, the home improvement Web site. Extending the living area outside is a new trend in Arizona, many are updating their Tucson homes. And bonus - it is a great investment into your home; both in returns when you sell and your enjoyment now. An outdoor kitchen with dining or seating areas nearby. Kitchens have gone from being simply an area with a barbecue grill to an entertainment island. Enjoy a built in BBQ or a built-in bar with seating. The possibilities are endless! Fire features. Fire pits tend to be more popular than fireplaces. Although fireplaces can be a beautiful focal point for a yard, fire pits are usually less costly and allow more people to gather around the flames. Fire features are generally powered by natural gas or propane, as are barbecues, because of no-burn restrictions. New choices underfoot. 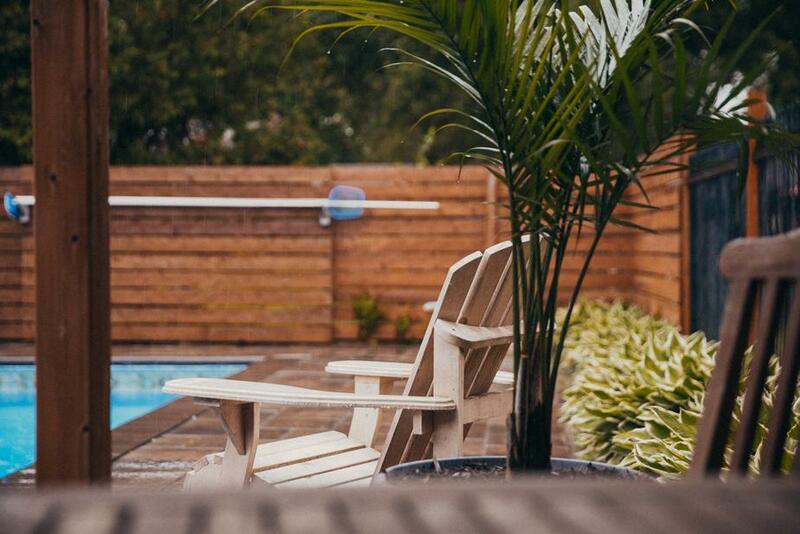 Concrete pavers and/or travertine tiles are often used to replace the old decking around swimming pools and the paving under covered patio areas. Shade structures, including ramadas and patio covers. Another option, sometimes homeowners don't need something as large as a ramada and might just prefer to plant a good shade tree. Electronic entertainment. Installation of outdoor television sets has become almost a necessity. There is also big demand for speakers outdoors to provide background music for entertaining and dining. Improved lighting. Good outdoor lighting is a must for outdoor living. New systems of LED lighting will use far less power than the old lighting you might already have. Outdoor misting systems. Perfect for Tucson, AZ summers, make sure you invest in a commercial grade system. For more suggestions, check out Rosie on the House. I hope some of these options help you enjoy your home and it’s extended living area. As a Tucson, AZ Real Estate agent, my services extend well beyond helping buyers and sellers through their transactions. Please contact a Tucson, AZ real estate agent if you are selling a home in the Tucson area. I look forward to hearing from you! 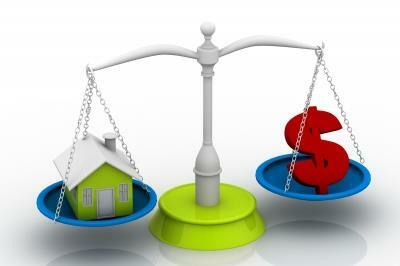 As a home buyer in Tucson, AZ, are you wondering how the market is doing? The S&P CoreLogic Case-Shiller National Home Price Index results just came out and there is good news for home buyers. Home buyers are pulling back, and prices are finally following. Home prices are still rising, but the gains are shrinking. In June, prices nationally rose 6.2 percent year over year, according to the S&P CoreLogic Case-Shiller Index. That is down from the 6.4 percent annual gain in May. “We’ve been running faster than we should be able to sustain for quite some time,” said David Blitzer, managing director at S&P Dow Jones Indices. Mr. Blitzer said that, over the next year or so, price gains are likely to ease until they are more in line with wages and inflation. Home prices in the nation's 10 largest housing markets rose 6 percent annually, down from 6.2 percent in the previous month. In the 20 largest markets, prices were up 6.3 percent, down from 6.5 percent in May. Home-price growth slowed in June for the third straight month, this welcome news for Tucson, AZ home buyers. The housing market has been slowing in recent months, a result of rising mortgage rates, a lack of inventory and a run-up in prices that has strained affordability. Existing-home sales have declined for four straight months, the National Association of Realtors said last week. Sales of new homes declined for the second straight month in July, the Commerce Department said Thursday. You can read more about these results at the Wall Street Journal. If you have been on the fence as to whether you should buy a home in Tucson, now is a great time! When you are ready, contact an experienced Tucson, AZ Real Estate agent. I'm committed to providing you with the highest quality service. You deserve to have all the latest market information and the very best advice, both of which I can provide you with. I hope to speak with you soon! Sunscreens. These screens, made of polyester with a vinyl coating, are a low-cost, efficient way to stop 80 percent or more of the heat and UV rays coming through your windows. And don’t worry, they won’t block your view. The darker screens, in dark brown or black, will allow you to see your landscape views more easily than a lighter screen. Customers who get power from SRP (Salt River Project) are eligible for a credit based on the square footage of screens placed on their house. In addition, there will be savings on monthly utility bills for less air conditioning that will help pay for the screens. Fabric Awnings. If you have a handful of windows that need shading, fabric awnings can be an economical solution. They can be designed to set off the architecture of your home no matter the style of your home. A single awning can reduce the heat coming through the window from the west by 77 percent or from the south by 65 percent. Rosie on the House recommends, Phoenix Tent and Awning – they have been installing awning products since 1910. About 30 to 40 years ago, lateral arm-extruded arm retractable awnings became available. So now, when they're not needed, awnings can be closed manually via a hand crank or can be closed automatically if they are motorized by pushing a button or setting a timer. Roll curtains that roll up and down. These types of mesh or Sunbrella curtains are perfect for covered patios. A giant shade curtain can be rolled down at dinner time to provide shelter on a patio that gets intense heat from the west side. Or maybe, you need that kind of shade for your morning coffee on the east side of the patio. They can also be designed to roll up when it gets windy outside. These shades can also be controlled by a rope and pulley, a hand crank or a motor. Shade sails and umbrellas. A newer trend is shade sails – large pieces of mesh fabric stretched out and fastened on posts driven into the ground. The shade from the sail can shelter swimmers in a pool or diners at an outdoor table. Shade trees. Strategically placed trees can reduce your air conditioner use, according to the U.S. Department of Agriculture. If you plant a tree today on the west side of your home, in five years your energy bills should be 3 percent less, and in 15 years, the savings will be nearly 12 percent, according to the Center for Urban Forest Research. Many trees that do best in the Phoenix and Tucson area are native mesquites and Palo Verde's that only reach a height of 30 feet or so. They grow quickly and can provide a lot of shade. 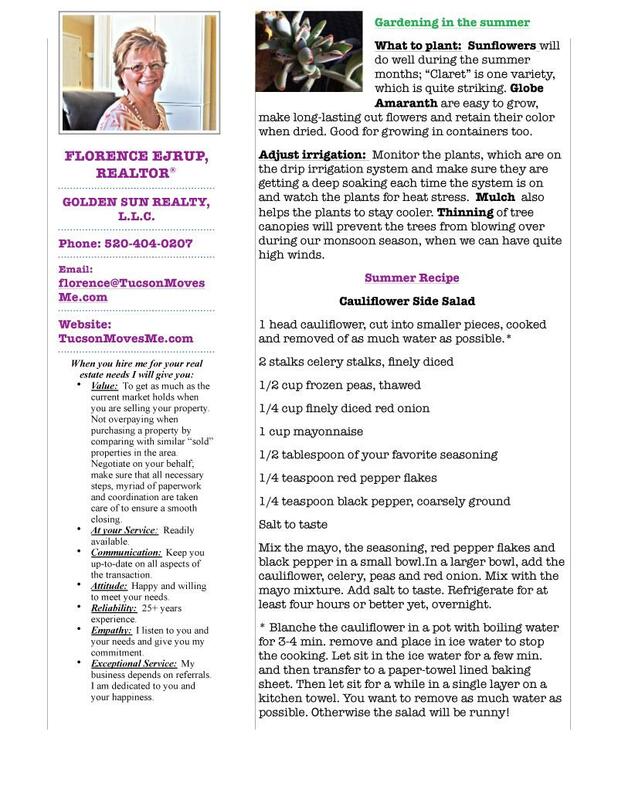 I hope some of these suggestions help you have a more comfortable summer and help lower those utility bills. As a Tucson, AZ Real Estate agent, my services extend well beyond helping buyers and sellers through their transactions. 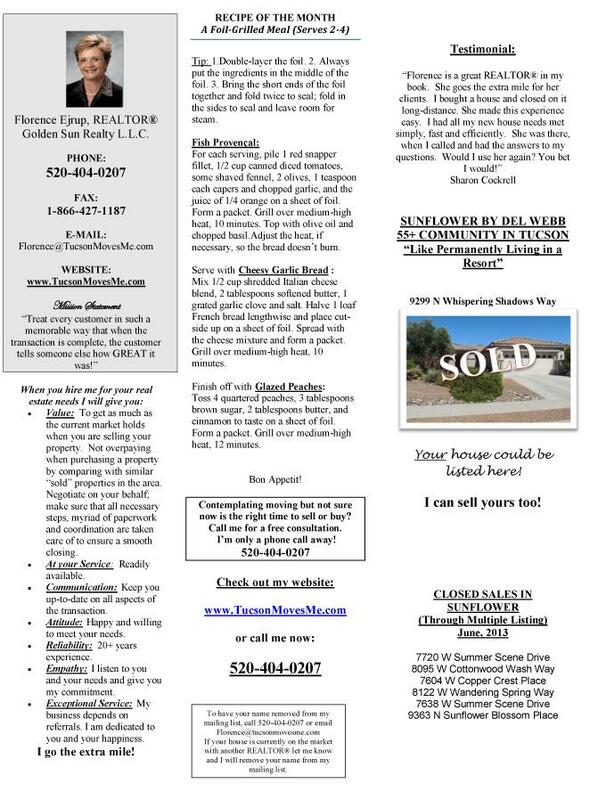 Please contact a Tucson, AZ real estate agent if you are selling a home in the Tucson area. I look forward to hearing from you! The monsoon season officially started June 15 in Tucson, AZ and will last until mid-September. This rainy season is necessary to relieve drought in the desert, but, the dry weather has continued so long that many Tucson, AZ homeowners may have neglected inspection and repair of their roofs. Roofs take a beating and are prone to destruction from the harsh Arizona weather. Here are nine spots to check on your Tucson, AZ home’s roof to ensure your roof is in its best shape by Blogger Rosie on the House. The "dead" valleys. If you have peaks on your roof, there are valleys between those peaks that need cleaning so that rainwater can move smoothly down your roof. Unless you're a roofer yourself, you probably don't want to go up there to rinse off leaf and dirt debris that can cause water to pool up on your roof. You may want to hire someone to do the job instead. Aging ridgelines. 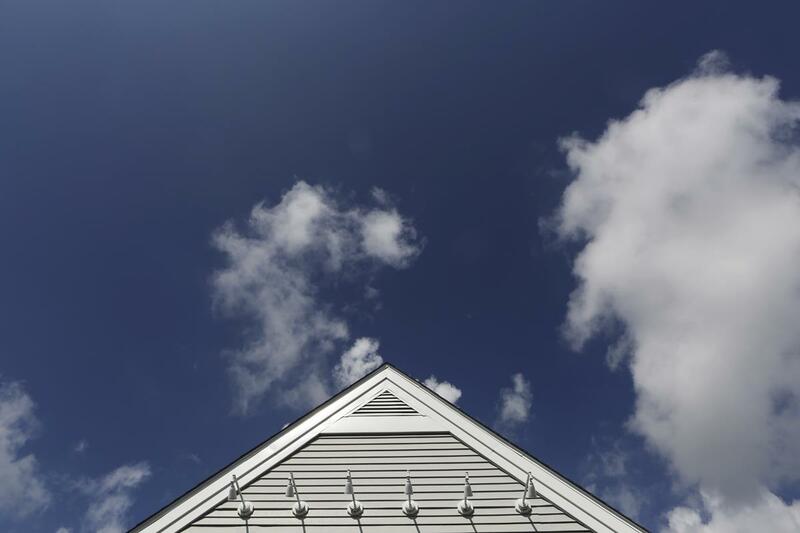 If you have peaks on the roof, you may also have ridgelines with vents in them for your attic. Those vents can leak over time and need repairs. You or a roofing expert can check the wood on your attic ceiling for signs of leaks as well. Clogs in scuppers and gutters. Just like the valleys between peaks, scuppers -- usually drainage lines on a flat roof -- and your gutters need cleaning before the storm season arrives. Missing gutters. Most Arizona homes, especially those built in the past 20 years, don't have any gutters. Because of our low rainfall, homeowners don't notice many problems. But you could benefit from having a gutter or two to carry away the water from the foundations of your house. Think about having gutters installed. Missing or broken tiles. Rustic looking true clay tile roofs can be very vulnerable to damage in the Arizona sun and wind. They can break or crumble in crucial areas. Concrete tile roofs are sturdier, but even some of them break now and then and need replacing. Disintegrating shingles. Quality asphalt shingles are among the most long-lasting roofing materials. But over time, shingles can crack, curl and shrink; granules begin to chip off the shingles leaving them more exposed to gusty wind and rain. It may be time to replace your shingle roof. Flat roofs. Many Southwest-style homes in Arizona have flat roofs but remember that they are not really flat. They generally slant slightly or have drains that allow water to flow into gutters or scuppers that carry away water. You want those drainage areas to be clean and clog free. Many older flat roofs are covered with built-up asphalt and tar. You can redo your built-up roof with foam to give more protection. If you do install foam, have it inspected every five years or so to be sure it's in good condition. Birds often peck holes in the foam on flat roofs. Humans walking around on a flat roof can also do damage. The underlayment. The underlayment is the paper or felt laid over the plywood sheathing on top of your house. That layer is then covered with tile. The underlayment will not last forever. If you have an older roof of this kind, an expert can pull up a few tiles to look at the quality and condition of your underlayment. It may need replacing. Penetrations and joints between differing materials. Vulnerable spots can develop on your roof where there are chimneys, walls, skylights, plumbing and exhaust vents from bathrooms and kitchens as well as fascia boards. If the dissimilar materials and flashings that cover the joints aren't done correctly, water and wind can damage roofing. If you know you have any of these problems, call a roofer and have them checked out further. If you've never had a roof inspection, now might be a good time to find out how your roof is doing before you have to learn the hard way during a storm. As a Tucson, AZ Real Estate agent, my services extend well beyond helping buyers and sellers through their transactions. 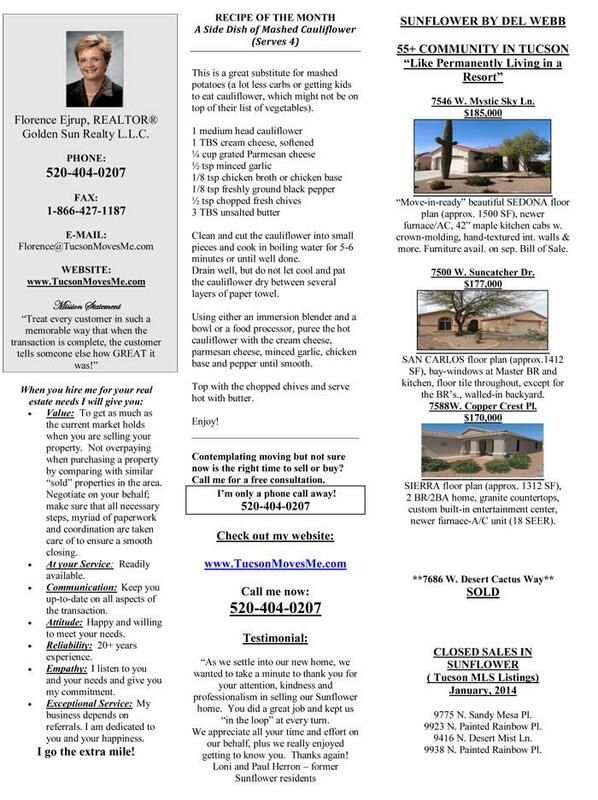 Please contact a Tucson, AZ real estate agent if you are selling a home in the Tucson area. I look forward to hearing from you! 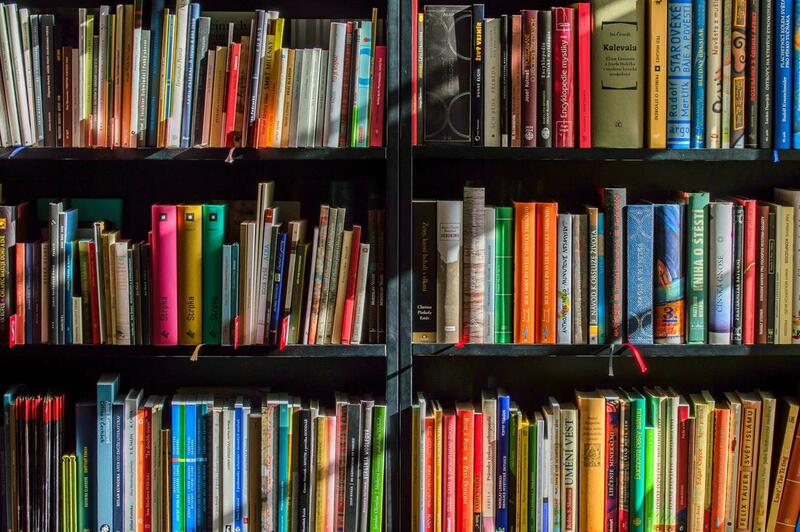 What do you do with the walls and walls of books in your Tucson, AZ home? Or the memorabilia? Scanning in photos and letters into digital format is becoming more popular and there are services that can help you with this process such as ScanDigital.com. As for other physical items, a good rule of thumb to follow is “If you lost it, would you buy it again?” If the answer is no, then you have your answer about that certain item. There are other great tips in the book “Goodbye, Things” by Fumio Sasaki that can help you pare down the years of “stuff” that has accumulated in your house. Looking to downsize to a new home in Tucson, AZ? I can help! As a Tucson, AZ Real Estate agent, my services extend well beyond helping buyers and sellers through their transactions. 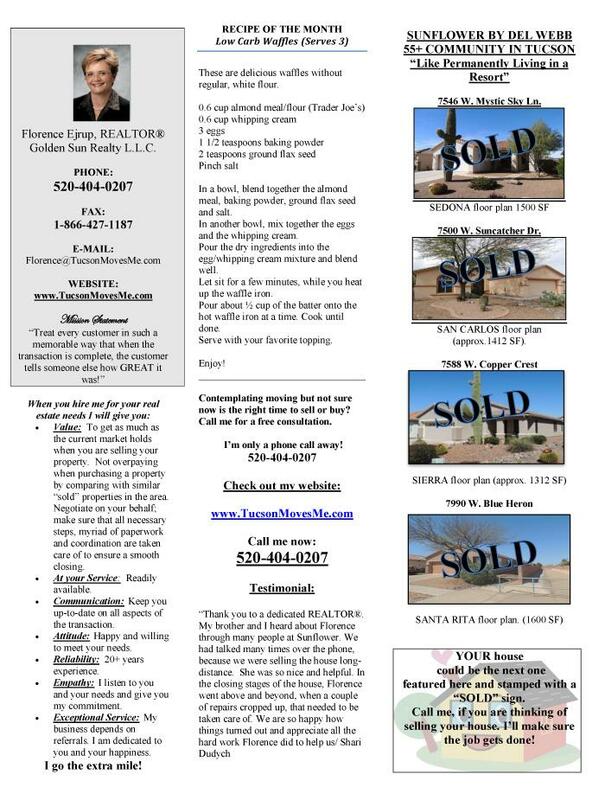 Please contact a Tucson, AZ real estate agent if you are selling a home in the Tucson area. I look forward to hearing from you! Look for strong materials: In a security door you want thick-gauge steel, not aluminum. Make sure you’re getting everything you’re paying for: The price should cover lock and lever, the delivery, and the installation. You want your door mounted securely: The mounting should penetrate at least 4 inches into the wall. Don’t skip on installing latch-and-lock guards and strong hinges: The guards are the metal plates that keep burglars from using tools to pry open the door. Plan ahead for a high-tech future: Ensure that the openings for the door’s hardware can accommodate Bluetooth or Smart Home locks. Choose power-coating instead of painting for the door: Choosing a baked-on powder-coated finish will ensure you avoid problems such as rusting and chipping. Today’s security doors can have a high-end elegant look: Check out several examples on RosieOnTheHouse.com’s blog. As a Tucson, AZ Real Estate agent, my services extend well beyond helping buyers and sellers through their transactions. Please contact a Tucson, AZ real estate agent if you are selling a home in the Tucson area. I look forward to hearing from you! Summer and its scorching hot days are coming soon here in Tucson, AZ. If you’re like most homeowners, you notice your pocketbook tends to get thinner as the temperatures rise and energy costs peak during the warmer months. However, there are some simple ways to keep your utility bills low and your bank account happy. You’ll also be doing your part to help save the environment, as it is estimated that half of the energy used in your Tucson, AZ home goes towards maintaining a comfortable temperature. Ready to save money on your cooling costs? Here are some tips and tricks to try, focused specifically on window treatments. The newest style of window treatments can help keep you more comfortable during these moths, as well as your pocketbook. A quick and easy fix, it’s worth the investment! Draperies. Heavy draperies are far less common these days, but it can help reduce your heat gain by up to 33 percent. You will lose some light but the reduction in heat is a big advantage. Shutters. A popular option in both style and efficiency is plantation shutters. You can adjust the light coming from outside with the louvers based on your needs. They are sturdy and long-lasting options constructed out of wood or faux wood. Plantation shutters are also a breeze to clean! Roller Blind Shades. These solar shades can be installed inside the window frame and are available in various levels of opaqueness or transparency to customize to your needs. You can block out those UV rays and still see your view outside. In bedrooms the darkening option is very popular. Honeycomb or Cellular Shades. Cellular shades provide insulation against heat by trapping the air in the cells of the shade. Available in both single and double cells for higher insulation. High Reflectivity Films. Another popular option in dessert climates is to install high-reflectivity films on your current windows. Silver, mirror like films are more effective than colored, more transparent ones. The only downfall is they may impair your view of the outside and require extra care when cleaning windows. 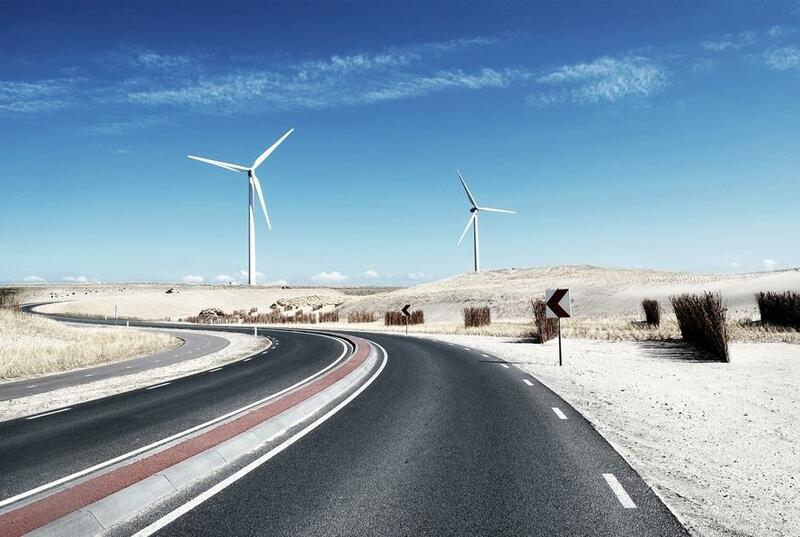 Take these steps to lower your energy costs as the temperatures start rising and you’ll find that you have some extra cash to spend on your summer adventures. 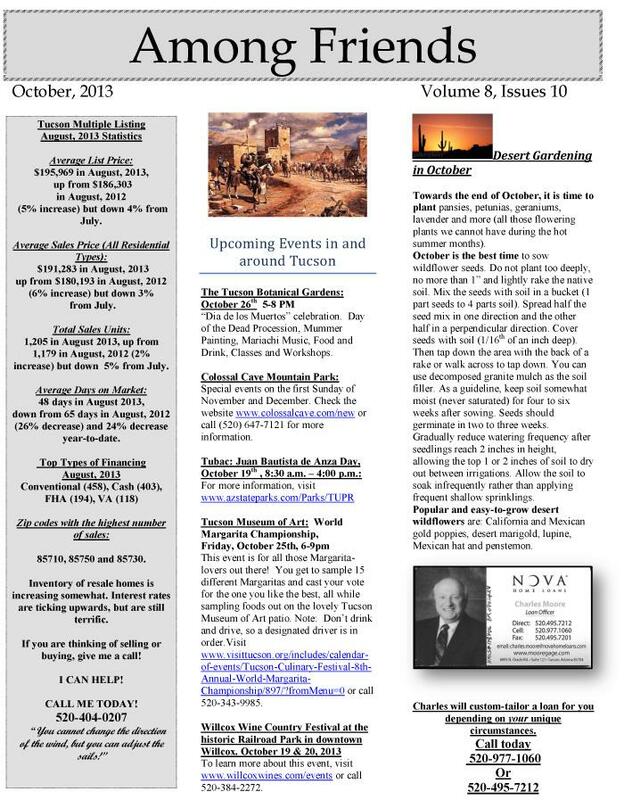 If you’re planning to buy or sell a Tucson, AZ home this fall, please let me know! Despite widespread fears to the contrary, the IRS has clarified that last year’s big tax bill did not kill all interest deductions on home equity lines of credit (HELOCs) and equity loans. This is good news for Tucson, AZ homeowners who opened a recent home equity line of credit and wish to receive a tax deduction. In a policy statement, the IRS said that it has received “many questions … from taxpayers and tax professionals” about HELOCs and equity loans in the wake of the Tax Cut and Jobs Act of 2017, which passed in December. That legislation eliminated a section of the federal tax code authorizing interest write-offs on “home equity indebtedness” from 2018 through 2025. But as noted in this column in January, the law did not curtail deductions on all HELOC and equity loan interest payments. It depends on how you use the money you borrow. Taxpayers can “often still deduct interest on a home equity loan, home equity line of credit or second mortgage, regardless of how the loan is labeled,” said the IRS, provided the borrowed funds are used to “buy, build or substantially improve the taxpayer’s home that secures the loan” and the total debt on the house does not exceed statutory limits. There are some further details not to be missed to ensure you can take the deduction so please do check with your tax preparer. Tucson.com also has a good run down of the policy on HELOC interest deductions. Are you in the market to sell your Tucson home? Now that we are getting close to spring market, it is the perfect time to prep for your upcoming home sale! If you are wondering how home prices in Tucson are doing, look no further – the according to Bloomberg, the home sale market is excellent! To summarize the recent announcement from the National Association of Realtors, home prices jumped to all-time highs in almost two-thirds of U.S. cities in the fourth quarter as buyers battled for a record-low supply of listings. Single-family homes, climbed 5.3 percent from a year earlier nationally and reached a peak in 64 percent of metropolitan areas measured. Of the 177 regions in the group’s survey, 15 percent had double-digit price growth, up from 11 percent in the third quarter. Home values have grown steadily as the improving job market drives demand for a scarcity of properties on the market. 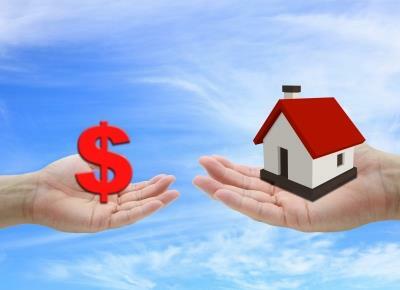 The consistent price gains “have certainly been great news for homeowners, and especially for those who were at one time in a negative equity situation,” Lawrence Yun, the Realtors group’s chief economist, said in a statement. 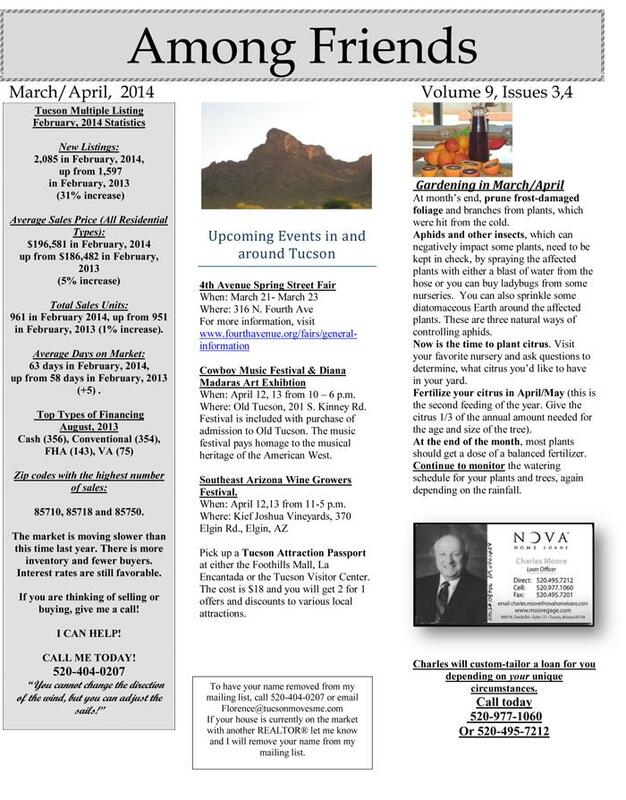 The spring real estate market in Tucson, AZ is just around the corner! Along with the rising temperatures of spring we will also see a rise in home prices in Tucson. 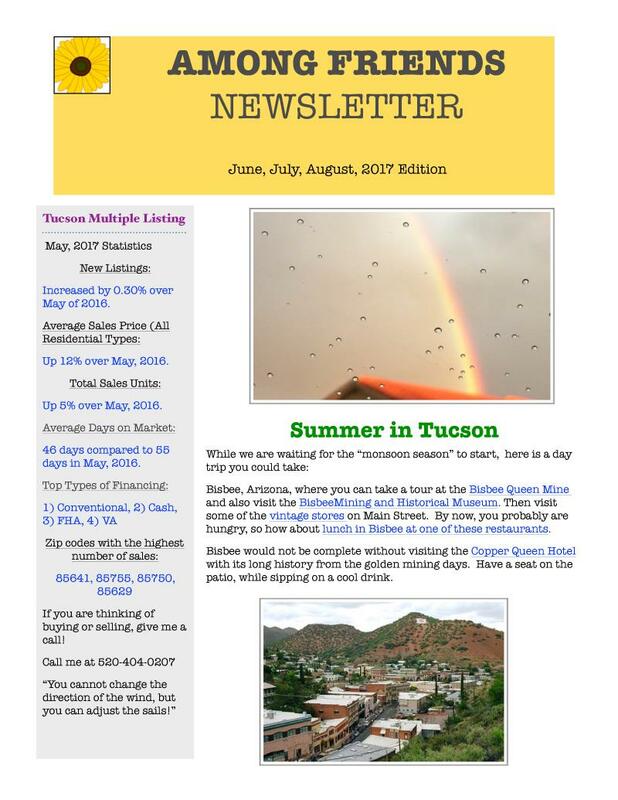 If you have been casually browsing the online listings and aren’t quite sure if you should jump in, spring and summer a great time to buy or sell a home in Tucson, AZ! According to a new study by CoreLogic, home prices jumped 7% annually this past November and will continue to climb throughout 2018. If you have been waiting on a good time to buy, now is the time, before prices soar. And if you’ve been waiting for a good time to sell your Tucson home, this year is the perfect time as prices will soar. 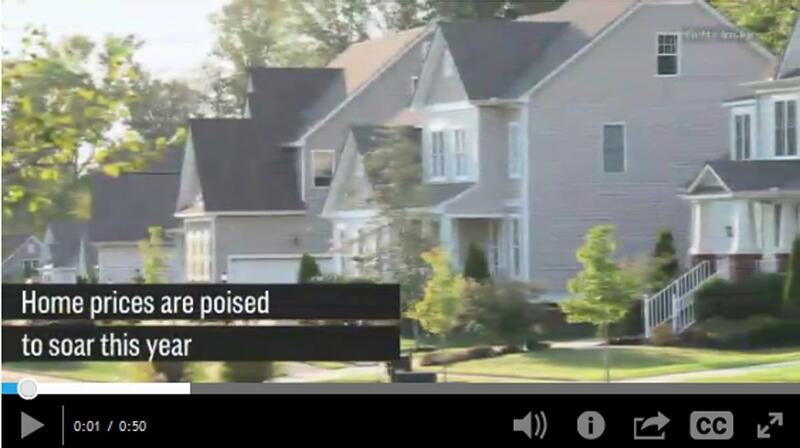 Check out the video posted by CNBC.com for more information on 2018 home prices. The Tucson, AZ real estate market continues to be a strong seller’s market. 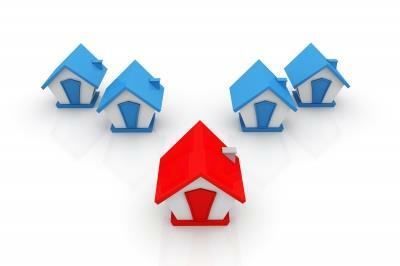 There is still an acute housing shortage, with the shortage worst at the low end of the market. This is good news for those on the lower end as prices in that tier are rising at double the pace of those in the high end. “Nationally, home prices jumped 6.2% in September compared with September 2016, accelerating from the annual gains in previous months, according to the S&P Case-Shiller Index. A survey by Zillow.com shows the difference in home price appreciation on the high end of the market versus the low end. The high end is defined as the top third of the market by price and the low end is the bottom third by price. The supply on the high end of the market is much greater, and the supply in the middle of the market, which is where most of the home-builders target, is growing, but there is not much hope for supply on the low end. So, if you have been waiting to ride this market out, you may think differently, especially if your home is on the low end of the market. A Tucson, AZ real estate agent can give you unbiased information about how your home would fare in today’s market. Tucson home buyer demand continues to outpace the supply of homes for sale, which has driven prices up across the country as well. 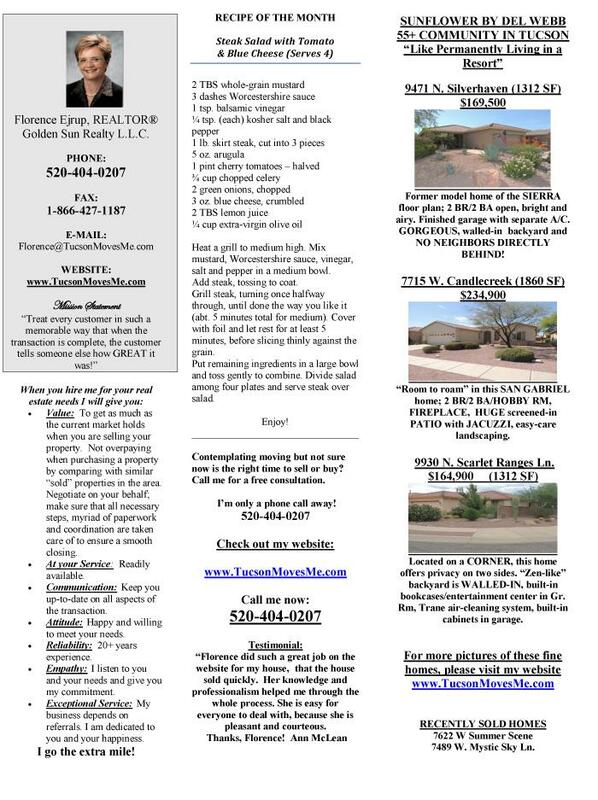 All of this boils down to if you are considering listing your Tucson home for sale, now is the time! Selling a home is an exciting and complex adventure. 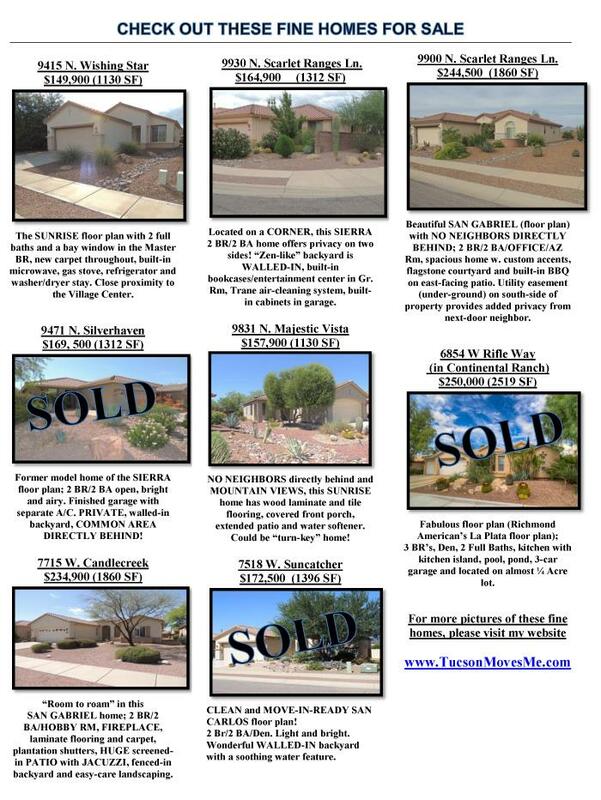 Contact a Tucson, AZ realtor to get the selling process underway! Whether you plan on staying in your Tucson home for many years to come or you plan to sell your Tucson home; its always a good idea to continually keep up with maintenance and improve your home each year. You don’t need to break the bank either to give your home a mini facelift, there are several things you can do for under $500. Paint. Painting is one of the cheapest and easiest home improvements to make. A fresh coat of paint will make any room look as good as new which is sure to add value. You can either go with a trendy updated color or stick to the neutrals, especially if you plan to sell soon. Borrow Ideas. Don’t hire a designer to give your home a facelift. Do the research yourself, there are plenty of websites to borrow design ideas from. Pick a project you can do yourself to save even more money. Energy Audit. Utility companies give out free audits to their customers. Take advantage and find out where and how you can improve your energy conservation. Being energy efficient looks great to a possible home buyer and also saves you money in the mean time. Plant a tree. Improve your curb appeal for not much cash. If looking to sell, it helps to spruce up the exterior and updated landscaping is a great start. Keep it Clean. Every season change it’s a good idea to go through closets and clutter and see what you sell, donate, or throw away. This is especially important if you are going to list your Tucson home for sale. New Fixtures. Replacing old fixtures, such as brass, updates your home immediately and for not much money. Replacing the old door knobs, faucets, and lights will really change the look of your home. During retirement, there may come a time when maintaining your current household just becomes too difficult. When the yard work and housecleaning become too much, or when you begin to struggle to get meals on the table, the obvious option many seniors consider: assisted living. Unfortunately, assisted living can be very expensive and, for some seniors, moving to an assisted living community signals a loss of independence and the end to a retirement spent traveling and enjoying life. But, assisted living isn't the only option for seniors who find living alone too burdensome. There's an alternative that could be less expensive while providing some of the same perks and benefits: life on the high seas. 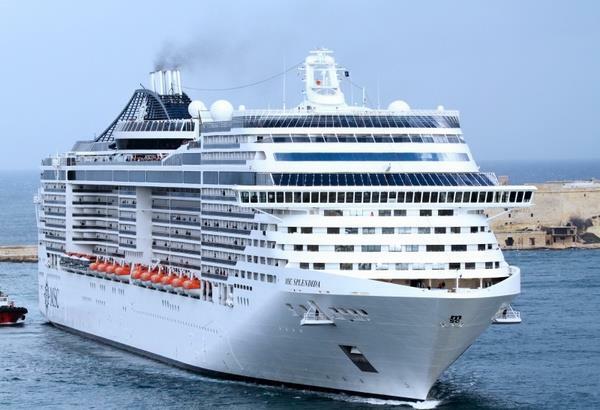 Many seniors are taking to cruise ships to live out their retirement. But, is it affordable? Average costs for an assisted living facility, as of 2017, are around $3,750 per month, according to the Genworth Cost of Care survey. This is around $45,000 annually, or $123 per night. The nightly cost of a cruise, on the other hand, averages around $100 per night or less. For example, a 12-night cruise of the Southern Caribbean, available for an average cost of $779 per person, is just $65 per night. For a senior couple traveling together, discounts of 50% for the second passenger lower combined costs dramatically. Senior discounts, points for frequent cruising, and booking with a rewards credit card keep costs down even further. USA Today offers an in-depth comparison if you want to read more. But, what if you aren’t fully ready to commit to an assisted living situation and don’t want to live life on the high seas? Tucson, AZ has been one of the fastest growing communities in the country for a long time, and with good reason – the relaxed, western flavor and year-round outdoor life make it a wonderful place to live. It's no wonder Tucson, AZ is a top retirement city, it's warm in the winter, has sunshine year round, gorgeous surroundings, and ample space. It’s the perfect spot to live out your retirement. 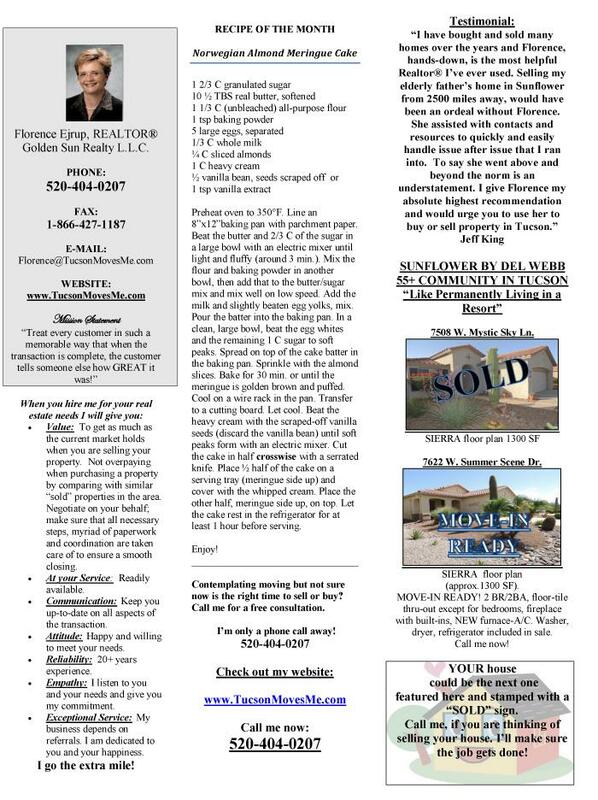 Sell Your Tucson Home Now While the Timing is Right! Recently released data from Fannie Mae’s National Housing Survey revealed that rising home prices were the catalyst behind an eight-point jump in the net percentage of respondents who say now is a good time to sell to sell your home. The index is now 21 points higher than it was this time last year and just below the all-time high in June of this year. Overall, 62% of Americans surveyed said that now is a good time to sell (up from 58%), while 26% of respondents said that now is not a good time to sell (down from 30%). The net score is the difference between the two percentages, or 36%. As home prices have increased, more and more Tucson homeowners have realized that now is a good time to sell their homes in order to take advantage of the extra equity they now have. Total Sales Volume of $318,919,230 is a decrease of 20.08% from June’s number of $399,061,482, but is an increase of 4.40% over July 2016. The Average Sales Price of $226,827 is a 4.79% decrease from $238,245 last month. Average List Price fell from $243,575 in June to $231,299 in July, resulting in a 5.04% decline. 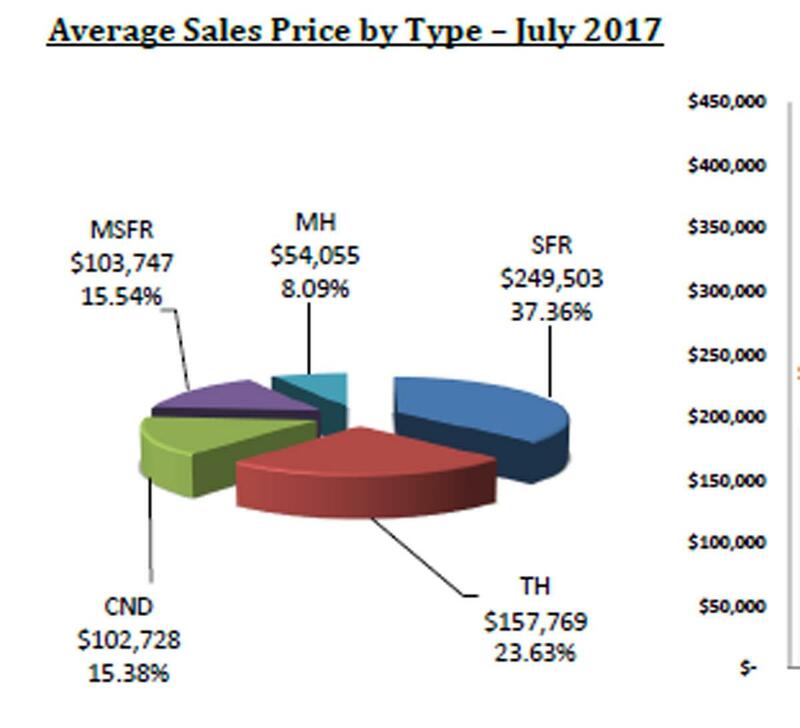 The Median Sales Price decreased 4.14% since last month, going from $200,000 in June to $191,725 in July, but is a 5.63% increase from July 2016. So, what does this mean for the average consumer? There are benefits for both Tucson, AZ buyers and Tucson, AZ sellers. For buyers, the prices are down from last month and interest rates are still historically low so now is a great time to buy, summer market or fall market. For sellers, there isn’t much competition out there, now is a great time to list your home. The days on market are the lowest it has been in 10 years! Need to sell quick? Not a problem. When you are ready to buy or sell your Tucson, AZ home, contact an experienced Tucson, AZ Real Estate agent. I'm committed to providing you with the highest quality service. You deserve to have all the latest market information and the very best advice, both of which I can provide you with. We’ve had some record heat this summer and our AC units are certainly being taxed. 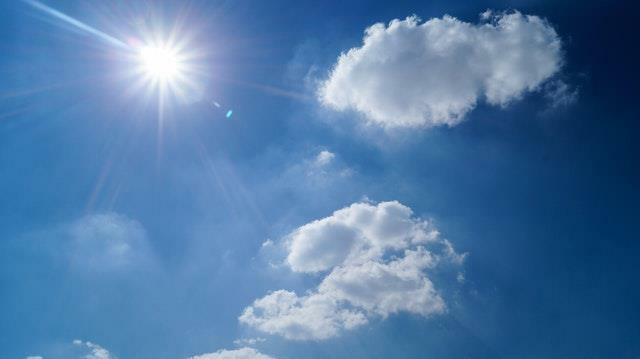 Below are some tips to help maintain your unit and keep your Tucson, AZ home nice and cool! • Maintain it. Have an air conditioning technician come to your home every spring before it gets too hot and check your system out. The earlier you catch a problem and repair it, the smaller the problem will remain. • Add insulation to your attic or crawlspace so hot air doesn’t get in the house. The warmer the home’s air, the harder the air conditioner has to work. The harder it works, the quicker it will wear out. • Make sure your unit is the right size. Bigger isn’t necessarily better when it comes to A/C. A room air conditioner that’s too big for the room it’s supposed to cool won’t operate as efficiently as a smaller one that’s the right size. • Install a whole-house fan. It will keep your home cool without using the air conditioner on days when the sun’s not too hot or overnight when the outside air is cooler than the inside air. • Install ceiling fans, or if you have them already, turn them on. Ceiling fans move the air so you’ll feel cooler, which will let you raise your thermostat a few degrees without noticing any difference in your comfort. • Keep lamps and TV sets away from your air conditioning thermostat. The thermostat can “feel” the heat from appliances and will respond by running longer than necessary. • Install a programmable thermostat and set it to automatically raise the thermostat a few degrees when you leave for work in the morning and again when you go to bed at night. You can also set it to cool the house before you get home from work or wake up in the morning. If you like technology, you can get a wi-fi enabled thermostat (like iNest and others), so you can control the heating/cooling from your smartphone. 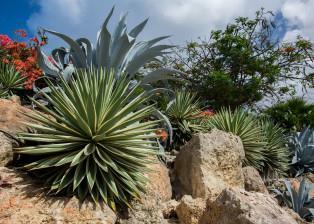 • Plant shrubs near your outdoor air conditioning unit to shade it. If you do, it will use up to 10 percent less electricity. A tip: Don’t plant so close to the unit that the shrubs block its air flow. • Block the sun from shining through windows and making your room hot. Install sun screens or apply sun-blocking film on east- and west-facing windows, and close drapes or blinds on hot, sunny days. • Replace your air conditioner filter every month. Switch to a one-inch pleated filter, which costs around $5 and will keep more dust and dirt away from your air conditioning unit than a cheaper, flat filter. • Replace incandescent light bulbs with compact fluorescent bulbs or LED lights. 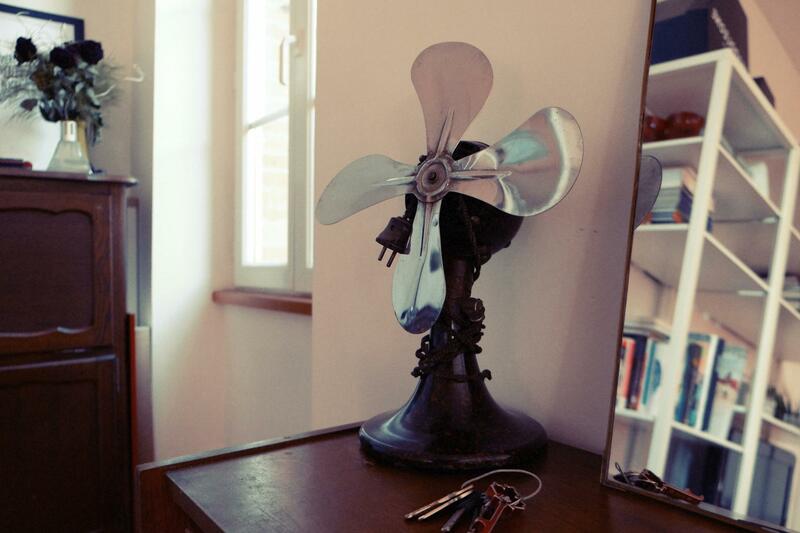 Incandescents give off more heat than light, and that can make your room feel warmer. CFLs are cool to the touch, use 75 percent less energy and last 10 times longer than incandescent bulbs. If you haven't shopped recently for light bulbs for your Tucson home, you might feel a bit confused in the light bulb aisle at your local hardware store. There are so many different sizes, types, and specialties to choose from these days. And whomever you find at the store to help you may not be up to date on the latest information either! So, what to do when you need to change out the bulbs for your Tucson home? Don’t worry, I’ve got you covered. What are the choices these days? 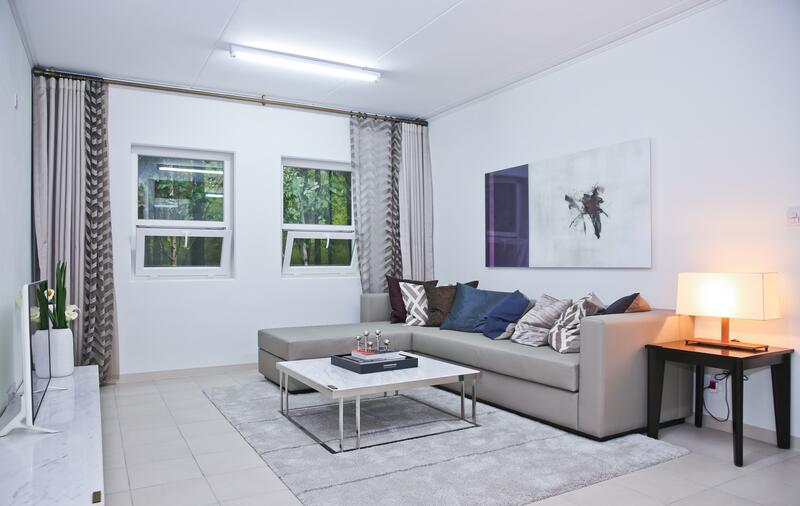 In addition to the incandescent that you are familiar with, you'll also find halogen bulbs (the highest efficiency incandescent), those compact fluorescents or CFLs, linear fluorescent tubes, LEDs (light emitting diodes) and smart bulbs. More regulatory changes are coming. Classic incandescent bulbs are not gone, but are being phased out. A great option is to buy LEDs for all fixtures in your house, because LEDs save energy and are long lasting. Lumens vs. Watts. With incandescent lighting, you replaced bulbs based on watts, which measure how much power a bulb burns up. But with LEDs you choose bulbs based on lumens, which measure how much light bulbs produce. If you used to buy 100-watt bulbs, look for a bulb with 1600 lumens; for 75-watt bulbs, look for a bulb with 1100 lumens; for 50-watt bulbs, look for a bulb with 800 lumens. Making a choice based on room. There is also the additional choice now of buying light bulbs according to their color rating index. CRI measures the ability of a light source to reveal the colors of various objects faithfully. Many brands will give suggestions on the box for the color rating to match your room. So, to buy the best bulbs for your money, you must know your socket type, the style of light you want as well as how bright you want the bulb to be and what color rating you want. Prices and savings. Thankfully, prices for LEDs have dropped considerably and will continue to come down in price. Most bulbs sell for less than $5. It's estimated that a $3 LED can cost you $1 a year on your utility bill while a similar energy-efficient incandescent can cost $5.42 a year. To get the best savings on power buy bulbs with the Energy Star label. Although this whole lighting issue has gotten more complicated, Arizona may be one of the places catching on more quickly to all the changes. A recent Nielsen Homescan study indicated that Phoenix is No. 10 among large U.S. cities where residents have purchased at least one LED in the past year. I hope I helped straighten out some of the confusion over the new choices in lights bulbs. Are you looking for the perfect time to sell your Tucson, AZ home? Now may just be that time. When you are ready to sell your Tucson, AZ home, contact an experienced Tucson, AZ Real Estate agent. I'm committed to providing you with the highest quality service. You deserve to have all the latest market information and the very best advice, both of which I can provide you with. I hope to speak with you soon! The spring real estate market in Tucson, AZ is booming! Along with the rising temperatures of spring we are also seeing a rise in the Tucson, AZ real estate market! 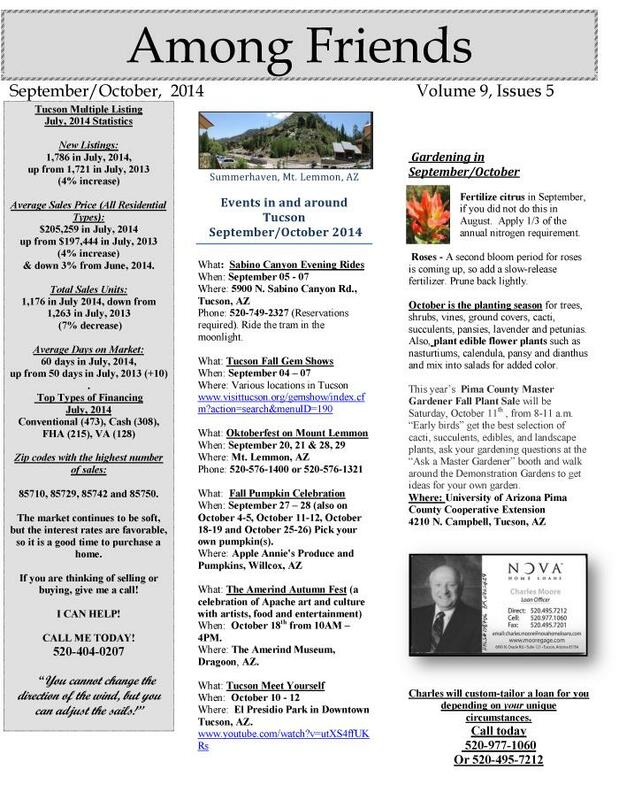 If you have been casually browsing the online listings and aren’t quite sure if you should jump in, spring and summer a great time to buy or sell a home in Tucson, AZ! Home sales in the first quarter hit their fastest pace in a decade, a sign that rising prices and slightly higher mortgage rates haven’t deterred home buyers from rushing into the market and have risen toward boom-era levels. According to the WSJ.com, total existing-home sales climbed 1.4% in the quarter to a seasonally adjusted annual rate of 5.62 million, the highest since the first quarter of 2007, according to the National Association of Realtors. The national median home price, meanwhile, jumped 6.9% from the same quarter a year earlier to $232,100, the sharpest price gain in nearly two years. Even amongst the rising prices and interest rates, it’s still a great time to get involved in the Tucson, AZ real estate market. Interest rates are still historically low for new and seasoned homebuyers. And if you need to sell, there isn’t much competition out there and you are likely to do well in this market. When you are ready to sell your Tucson, AZ home, contact an experienced Tucson, AZ Real Estate agent. I'm committed to providing you with the highest quality service. You deserve to have all the latest market information and the very best advice, both of which I can provide you with. I hope to speak with you soon! Your Tucson Home – Is Your TV Hard to Hear? Mishearing the TV in your Tucson home can be a sign of hearing loss, but your ears or age aren’t the only culprit. As TVs have improved, they have also gotten harder to understand. The blame starts with TV makers who are on a quest to make TVs slimmer and slimmer. Unfortunately, speaker technology hasn’t caught up with the slim trend and to produce a decent sound you still need a bit of room to do so. In addition to the slim trend you’d be hard-pressed find a model with speakers even facing you—most TVs have speakers that point down or toward the back, where sound can get muffled. Short of cranking up the sound, there are things you can do to hear the dialogue on your Tucson home’s TV better. Here are some proven strategies—plus new options for Tucson, AZ seniors and others who might experience moderate hearing loss. Fix the TV – Try moving the TV to a different spot, depending on acoustics you may get better sound. Replace your speakers – Buy separate speakers and enjoy the surround sound. You can place some behind your seating area for better sound. Bring the sound to you – invest in a headset and bring the sound to you. 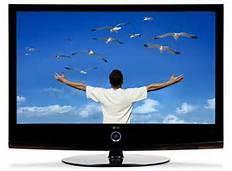 Some TVs offer Bluetooth technology so you can go wireless. As a Tucson, AZ Real Estate agent, my services extend well beyond helping buyers and sellers through their transactions, I’m here to offer you all sorts of tips, even these TV tips from The WSJ. 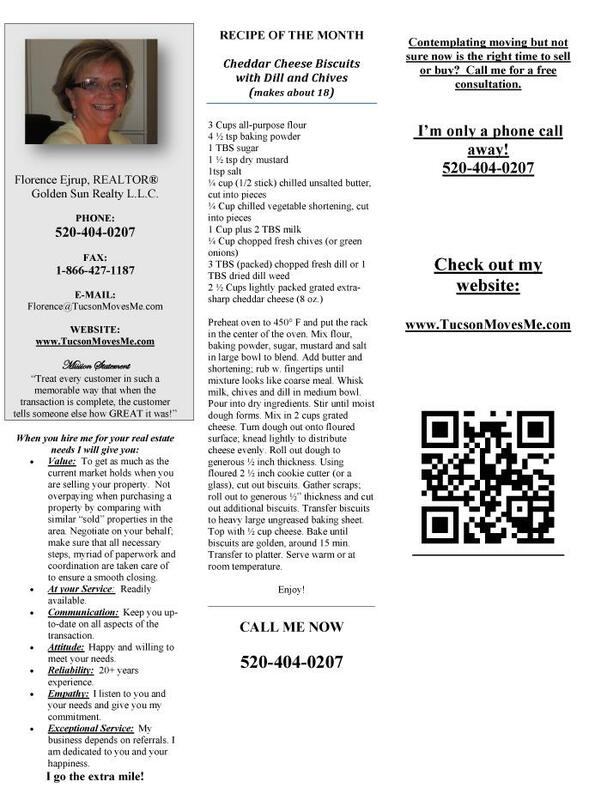 I specialize in 55+ communities in the Tucson, AZ area and would love to help you find the home of your dreams. Please contact a Tucson, AZ real estate agent if you are buying a home in the Tucson area. I look forward to hearing from you! Tucson, AZ has been one of the fastest growing communities in the country for a long time, and with good reason – the relaxed, western flavor and year-round outdoor life make it a wonderful place to live. It's no wonder Tucson, AZ is a top city for recreation, it's warm in the winter, has sunshine year round, gorgeous surroundings, and ample space. There are plenty of wonderful places to hike but one of them takes the cake, the La Milagrosa Ridge Trail. Many say that you will find a “miraculous experience” on this trail. Maybe it’s because Milagrosa means miraculous in Spanish. This 4.5 mile trail really lives up to its name. Offering birds eye views as you climb — sometimes gradually and sometimes steeply — the trail ascends a broad divide between La Milagrosa and Agua Caliente canyons, revealing ever-more-dramatic views into the gorges. It is the perfect time to see the diverse mix of cacti lining the route and wildflowers showing color, through March and April. Those who plan to travel the full route of the trail and come back down again should be fit, get an early start, and carry plenty of water and sun protection. Some measure this trail as 5 miles, not 4.5 miles. The Tucson, AZ Real Estate Market is Doing Great! Total Sales Volume of $237,338,796 is an increase of 13.60% over January 2016. Total Under Contract increased this month by 19.46%. Total Unit Sales of 1,093 is down from 1,229 in December resulting in an 11.07% decrease but is up from January 2016 by 13.26%. 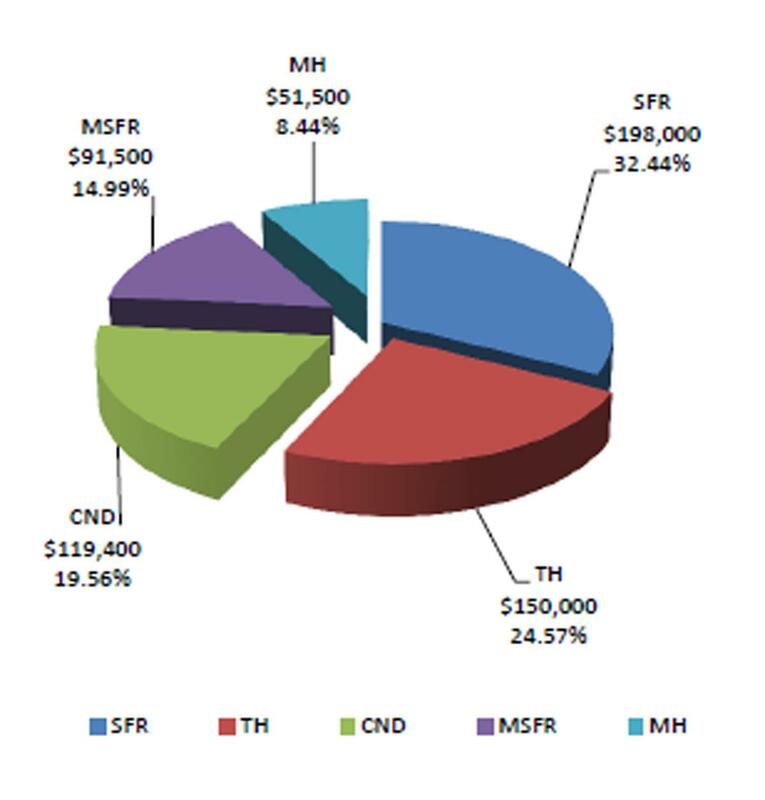 The Median Sales Price jumped 2.79% going from $179,000 in December to $184,000. This is also an increase of 8.30% over January 2016. Selling a home in Tucson, AZ can be quite an adventure and you will benefit from the help of a real estate professional. Think you can go this adventure alone? Think again. There are plenty of resources out there to help during your purchase, the most useful being a Tucson, AZ real estate agent. Spring is just around the corner and all signs point to the 2017 housing market strengthening in 2017. If you are looking to sell your Tucson, AZ home you are going to want to get the best price and the quickest sale possible. Is there an optimal time during the year when your Tucson, AZ home will sell the fastest and for the best price? Spring has always been a busy time for real estate and 2017 will be no exception. A recent article at Kiplinger.com highlights why 2017 will see gains in strength. Below are some of the main talking points. Single-family construction is up 9.6% and residential construction remains at a level that shows steady demand for housing. Building permits indicate that further growth is in store for residential construction in early 2017. Inventory is likely to remain low next year, but it could increase by year-end, but, the rise in mortgage rates and prices is likely to prompt more homeowners to put their homes on the market, which would lead to an increase in overall inventory later in 2017. These low inventories and modest economic growth should push up price growth in 2017 so this is good news for Tucson, AZ home-sellers. Are you looking for the perfect time to sell your Tucson, AZ home? Now may just be that time. When you are ready to sell your Tucson, AZ home, contact an experienced Tucson, AZ Real Estate agent. I'm committed to providing you with the highest quality service. You deserve to have all the latest market information and the very best advice, both of which I can provide you with. I hope to speak with you soon! Mortgage rates in Tucson, AZ have risen about a half percent since the election but the real estate market is still going strong despite the rise. Rates are higher and inventory is down 4.3% lower than a year ago, if you are thinking about selling a home in Tucson, AZ you can benefit from the lower inventory that we are currently experiencing. Because of this lowered inventory and therefore higher demand, price growth is going to stay strong even with the increase in borrowing costs. 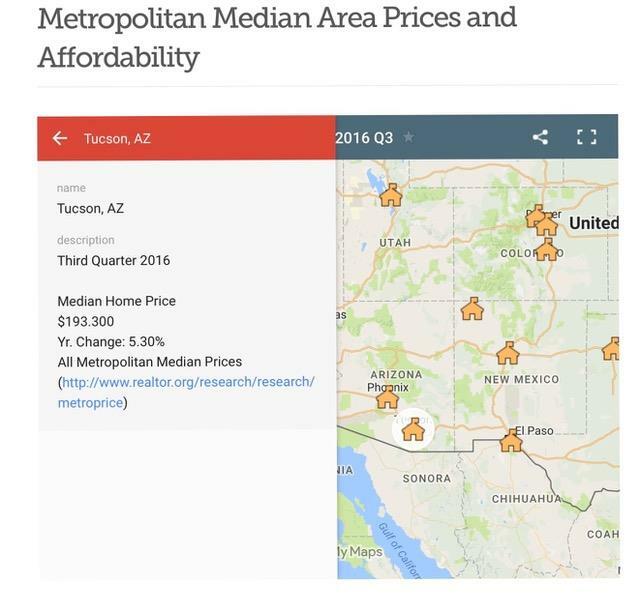 Per the above graphic from Realtor.org, the Median Home Price in Tucson, AZ was $193,300 in the third quarter of 2016, up 5.3% in the last year. With the recent increase in mortgage rates, a modest decline in sales volume is likely to occur in the next few months. Sales of existing homes rose 2%, to 5.6 million seasonally adjusted annual units in October – the fastest pace since February 2007. This was the second straight monthly gain and the sixth in the past eight months. The West had the largest year-over-year increase in recorded sales. The pickup in the pace of residential construction this year is a good sign that overall supply of homes will steadily increase, providing more choices for buyers and encouraging homeowners who want to trade up but have been worried about finding a new place to put their property on the market. 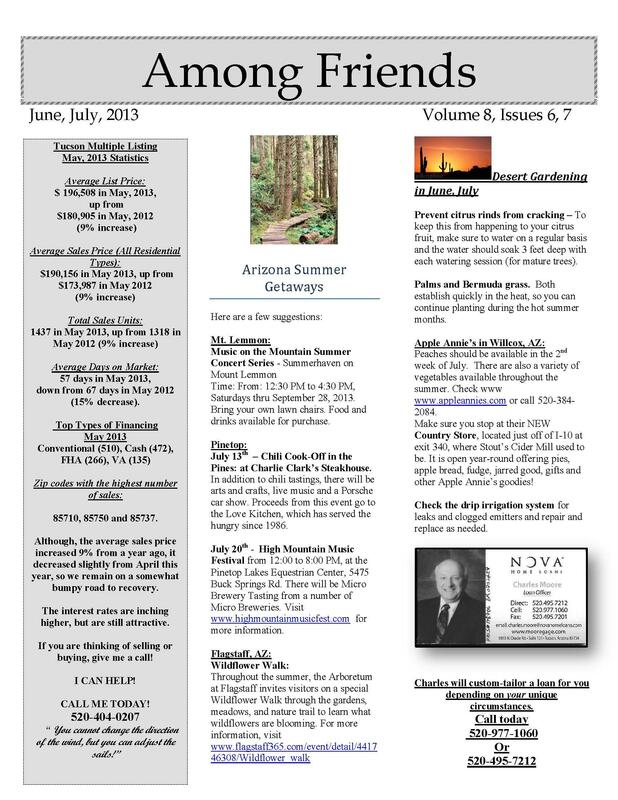 Read more on the latest Tucson, AZ market stats at Kiplinger.com. It is no wonder that Tucson, AZ is a top retirement city, it's warm in the winter, has sunshine year-round, gorgeous surroundings, and ample space. If you are nearing the end of your working days, how prepared are you? Long before you punch out for the last time there are many concerns you should address about your future Tucson, AZ retirement. Nasdaq.com has a breakdown of financial decisions you will regret in retirement and it’s worth the read for any soon to be retiree. Here is a breakdown of the main points. Relocating on a whim. Well before your retirement date, spend extended vacation time in Tucson, AZ to get a feel for the people and lifestyle. Too good to be true offers. There are no shortcuts when it comes to retirement. Hard work and careful planning is the only way to get there, not quick money schemes. Working indefinitely. It is best to set up a reasonable retirement goal date and stick to it. Another piece of sound advice is to “assume the worst, save early and often”. Don’t wait to save. Putting off your retirement savings until later in life is not recommended. The magic number, per Nasdaq.com, is $1 Million saved by age 65. Putting your kids first. We all want the best for our children but that should not come at the expense of our own retirement. Avoiding the stock market. Avoiding stocks because they are risky is one of the biggest mistakes you can make in your Tucson, AZ retirement. Sure, there are ups and downs, but, on average stocks return about 10% a year. If you are newly retired there are some financial mishaps to avoid so you can continue to live a comfortable life, even when retired. Us News has a list of 6 Big Mistakes to Avoid for the Newly Retired and it’s worth a read should you be thinking of retiring or are recently retired. Here is a breakdown of the 6 Major Mistakes you can make after retirement. Changing your lifestyle in a rush. It’s best to live the retirement life for a year before any major changes, such as buying new real estate or major travel. Live on the presumably lessened retirement income for a bit before making large purchases. Not planning for the unexpected. Make sure your retirement plan also plans for the unexpected such as sickness, injury, or any other life-changing circumstances. Loaning money to your kids. Of course most parents would help out their children financially, should they be able to, but it may not be in the best interest of the newly retired. Should you need to depend on that money down the road it will impact your retirement financial stability. And while we would hope the loan would someday be paid back in interest, it rarely is the case and you may find you aren’t as prepared for your years of retirement as you expected. Not planning with your spouse. Good communication is key between you and your spouse when it comes to retirement. Both how you will manage your money and how you manage your new time off should be discussed. Taking Social Security benefits too early. If at all possible you should wait until your full retirement age to take the benefits. You can take them at 62, but, they will be reduced benefits, by approximately 30%. Depending on when you were born your full retirement age is 65-67. Being too conservative with your investments. It is wise to be conservative and not take too many risks with your investments once you are retired. But, you can be too conservative. There is a fine line to walk between stocks, bonds, and cash. Whether you plan on staying in your Tucson home for many years to come or you plan to sell your Tucson home; the idea of a kitchen renovation is intriguing to many. 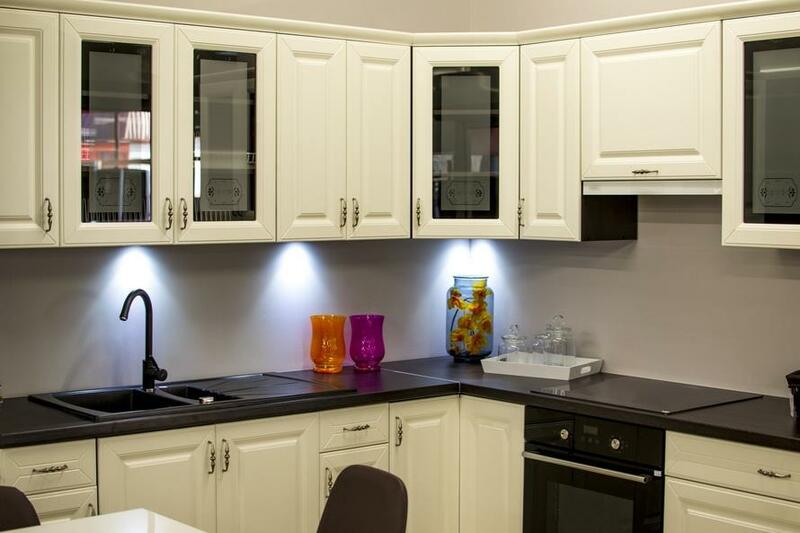 With the popularity of the HGTV reno shows many dream of having a bigger, better kitchen. If you are going to pay the type of investment that a kitchen redo requires, you want to make sure you do it right and get the most for your hard earned dollars. Those countertops might be gorgeous, but you'll probably love them even more if they bring in good return on your investment. If a buyer walks into your Tucson home and sees a dated kitchen they likely will assume it takes approximately $50,000 to update it, but, the nationwide average is actually closer to $20,000. Either way, this is a lot of money that a buyer may not want to invest on top of the price of your Tucson home. Even if you have no plans of selling soon, or ever, choosing the kitchen upgrades that can have the biggest impact on the look and function of your space while providing the best return on your investment is key. Put your money in the following areas to give you the best shot at both. Tucson, AZ – How “Green” is that Home? The trend to go green has spilled over into our homes and many Tucson, AZ homebuyers are looking for green features in their future homes. Who wouldn’t want to save on utilities, right? 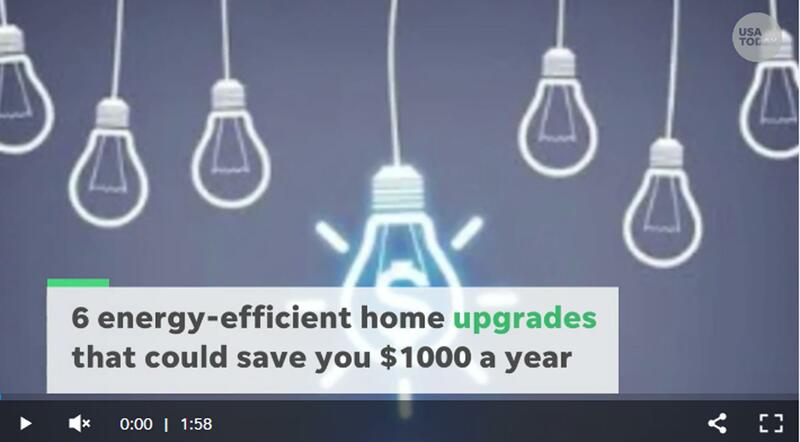 But, according to the Washington Post, Tucson, AZ homebuyers should be wary of houses that are marked as green or energy efficient. Unfortunately, the practice of “greenwashing” is alive and well in real estate. Greenwashing means a house is being marketed as environmentally friendly and energy-saving when it doesn’t deserve that description. Just about everybody likes the concept of green and some real estate agents may use the term as a sales come-on or just plain old don’t know what constitutes a truly green home. Experts say that, too often, what’s marketed as green isn’t what it claims to be when you take a closer look. When you are ready to buy your Tucson, AZ home, green or not, contact an experienced Tucson, AZ Real Estate agent. I'm committed to providing you with the highest quality service. You deserve to have all the latest market information and the very best advice, both of which I can provide you with. I hope to speak with you soon! Summer is in full effect here in Tucson, AZ and the temperature isn’t the only thing heating up right now, so is the Tucson, AZ real estate market! If you have been casually browsing the online listings and aren’t quite sure if you should jump in, summer is a great time! Buying a home in Tucson, AZ can be quite an adventure and you will benefit from the help of a real estate professional. Think you can go this adventure alone? Think again. There are plenty of resources out there to help during your purchase, the most useful being a Tucson, AZ real estate agent. Another useful tool comes from the Arizona Association of REALTORS. 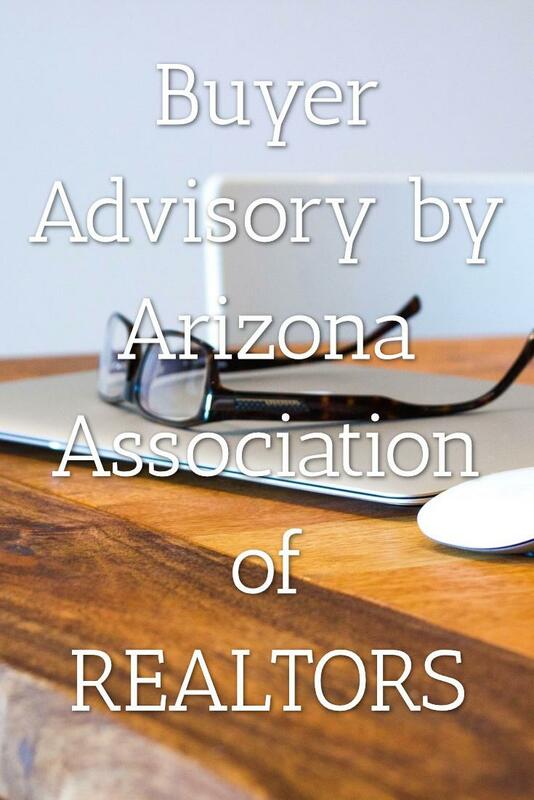 Before you decide to purchase your dream home in Tucson, AZ, you might want to check out the Buyer Advisory, a resource for real estate consumers, by the Arizona Association of REALTORS, you can download a PDF by clicking the image to the left. There are lots of links for you to click and do research on. You can never have too much information about a certain neighborhood and area. When you are ready to buy your Tucson, AZ home, contact an experienced Tucson, AZ Real Estate agent. I'm committed to providing you with the highest quality service. You deserve to have all the latest market information and the very best advice, both of which I can provide you with. I hope to speak with you soon! As if buying a home in Tucson, AZ doesn't come with enough challenges, it gets even trickier when you have a home to sell at the same time. There are about 86 million homeowners in America. If you’re one of them, and you need to move, there’s a reasonable chance you’ll find yourself facing this challenge. If you sell your Tucson, AZ home before you find a new home the clock is ticking and it may rush you into a new home that isn't ideal. If you buy a home in Tucson, AZ before you sell your home, you may end up with two mortgages. So, what are your options? Should you use a contingency? Some people in this situation will put a contingent offer on a house — the purchase depends on selling your current home. But that can make an offer less attractive and your offer might be passed up for a more solid offer from another homebuyer. 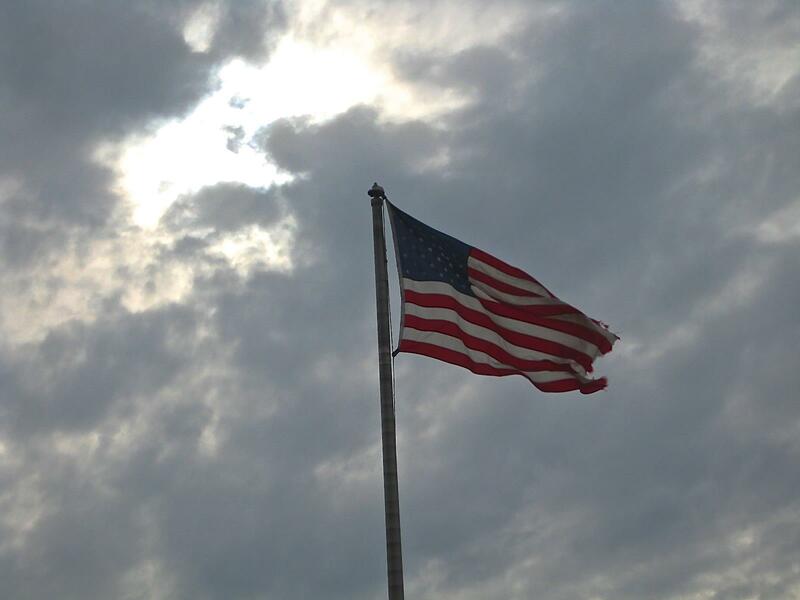 Bridge Loan or HELOC? A bridge loan, which allows you to tap the equity in your current home may be attractive to some would-be buyers. With this short-term financing, you can buy a new home before you sell your house. You’re essentially financing two homes at once, temporarily. After you sell your Tucson, AZ home you can pay off the bridge loan. An alternative is to tap into a home equity line of credit that you've opened previously. Either way, you’ll need pristine credit and plenty of equity in your current home. Buy and sell at the same time? It is certainly possible to get through selling your home and buying another at the same time – with minimal stress. So how does one do that? Use an experienced, efficient Tucson, AZ real estate agent. Be aware of the market. If you are thinking about purchasing a home in Tucson, AZ you are likely getting a lot of advice from all sorts of sources: friends, family, and the internet. Although your friends and family have your best interest at heart they may not be fully aware of the current Tucson, AZ market or your exact real estate needs. Along with the well-meaning advice, there are a number of myths that circulate about how real estate actually works. Here are several common real estate myths that trip up many would-be homebuyers and sellers. You can get a better deal as a buyer if you don't use a real estate agent. This is completely false as the commission is paid by the seller. Not using a Tucson, AZ buyers agent will not save you any money. You'll earn back what you spend on renovations. There are very few renovations that actually get you back your money at the closing table, specifically a new front door. Open houses sell properties. While it never hurts to have one, a broker's open house tends to be more useful than a public open house. Are you one of the lucky ones who had the opportunity to pay off their Tucson, AZ mortgage in full? Did you notice any additional charges at the closing of your Tucson, AZ mortgage? For years it was widely considered a massive, government-sanctioned rip-off of home mortgage borrowers. Then it was banned by the Consumer Financial Protection Bureau. And now it’s the subject of class-action suits that accuse four large banks of illegally collecting millions of dollars in excess mortgage interest payments from their customers. What was the controvery? Interest Overcharges. The Federal Housing Administration (FHA) had a long-time policy of allowing banks to charge homeowners a full month’s worth of interest when they went to pay off their FHA-insured loans — even after they had paid back all the principal they owed. Imagine going to the pump for 3 gallons of gas and being charged for a full tank. This is akin to what was going on at the pay-off of these Tucson, AZ loans. Are you still looking to purchase your dream Tucson, AZ home? When you are ready to buy your Tucson, AZ home, contact an experienced Tucson, AZ Real Estate agent. I'm committed to providing you with the highest quality service. You deserve to have all the latest market information and the very best advice, both of which I can provide you with. I hope to speak with you soon! Tucson, AZ – When is the Best Time to Sell Your Home? Spring is in the air and the 2016 real estate market is really beginning to ramp up. If you are looking to sell your Tucson, AZ home you are going to want to get the best price and the quickest sale possible. Is there an optimal time during the year when your Tucson, AZ home will sell the fastest and for the best price? One group of researchers at Zillow says yes. 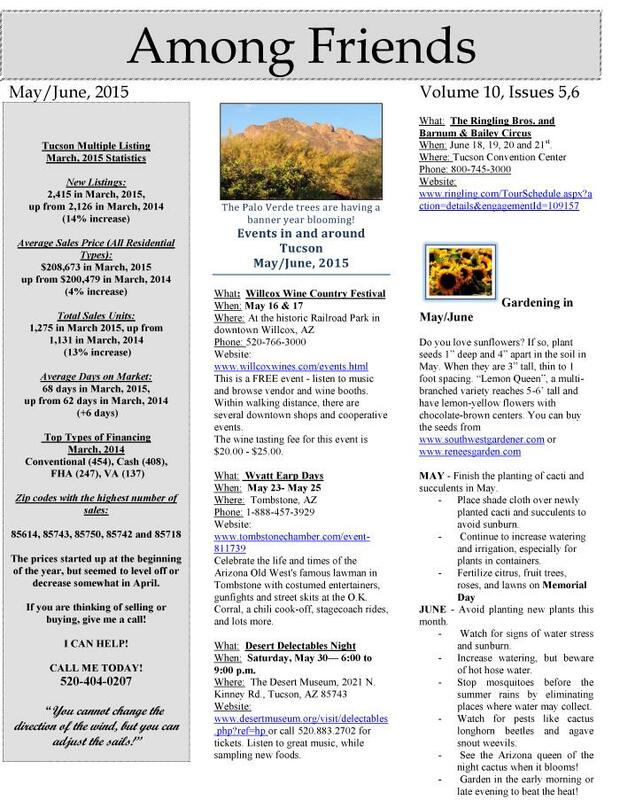 This is great news for Tucson, AZ home-sellers as May is just around the corner! I’d be happy to work with you to give you a comparative market analysis of your home and speak about timing your sale just right. A Tucson, AZ real estate agent will have their finger on the pulse of the market and know the best way to proceed. I hope to hear from you soon. Contact a Tucson, AZ real estate agent today! Tucson, AZ is a wonderful place to visit during the winter months with warm temperatures and tons of sunshine. Winter is well-known as one of the best times to visit because of this gorgeous weather. During the winter there are many outdoor events, among them is the annual rodeo event, Tucson Rodeo, which starts this Thursday, February 18th with a parade. Each year, more than 200,000 people enjoy the western-themed floats and buggies, historic horse-drawn coaches, festive Mexican folk dancers, marching bands and outfitted riders. The route begins at Park Avenue and Ajo Way, continues south to Irvington Road, then heads west on Irvington Road to South 6th Avenue. A favorite among Tucson, AZ locals and visitors, the Tucson Rodeo Opening Day is at the Tucson Rodeo Grounds on Saturday, February 20th. The rodeo fun continues all through the following week, with a full schedule, and ends with the rodeo finals on Sunday, February 28th. There is also an Rodeo Museum, which is well worth a visit. 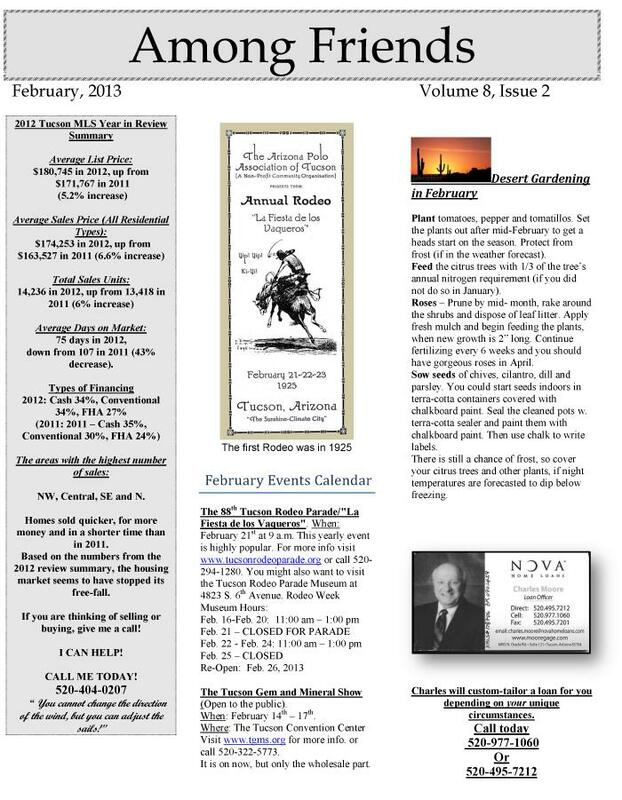 To learn more about the history of the Tucson Rodeo, visit the Tucson Rodeo Website. If you are visiting us in hopes of buying a Tucson, AZ home and need a local expert to help show you around please contact a Tucson, AZ real estate agent. I'd be happy to assist you in any way possible. I hope to hear from you soon! Congratulations, your Tucson, AZ home has an offer on it and you've made it all the way through pricing negotiation and on to the appraisal. You and your Tucson, AZ real estate agent have compared similar homes in your neighborhood and assume the appraisal will go through without a hitch. Unfortunately what you thought was a done deal has been held up with an unmatched appraisal and it looks like your deal might fall through. This scenario seems pretty far fetched but it has been happening more often due to subjective decisions made by home appraisers. According to research provided by the National Association of Realtors, more than 1 out of 5 home real estate contracts are delayed because of disagreement over the appraisal. As reported by The Washington Post, a massive first-of-its-kind study followed 1.3 million individual appraisal reports from 2012 through 2015. They suggest when challenging an appraiser's number to look at adjustments involving relatively subjective estimations – such as the appraiser's opinion on the overall quality level of your house, its condition and location, and more. These subjective adjustments may lead to a much different appraisal on your Tucson, AZ home than you were expecting. According to the study, adjustments were made in 99.8 percent of all appraisals. Adjustments on objective features, such as living area, rooms, or car storage tended to not amount to much difference in pricing. 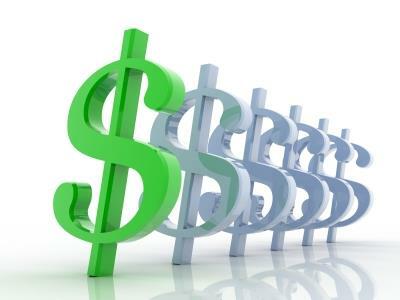 However, adjustments involving more subjective matters triggered much bigger dollar changes, with an average adjustment of $15,000. That $15,000 could make or break your Tucson, AZ home sale so it is definitely something to be aware of. So, what to do if you receive bad news from the appraiser? Have your Tucson, AZ real estate agent take a look at the adjustments made on the subjective factors such as condition and quality. When you are ready to sell your Tucson, AZ home, contact an experienced Tucson, AZ Real Estate agent. I can help you navigate the tricky waters of your home sale, including any appraisal issues. I hope to speak with you soon! As we finish out 2015, the Tucson, AZ real estate market has something to cheer about. There has been steady growth in your home's equity, according to new data from the Federal Reserve. Home equity is the difference between the market resale value of your Tucson, AZ home and the mortgage debt you have against it. Between the third quarter of 2014 and the same period in 2015, American's home-equity holdings grew by nearly $1.3 trillion, due mainly to rising home prices. 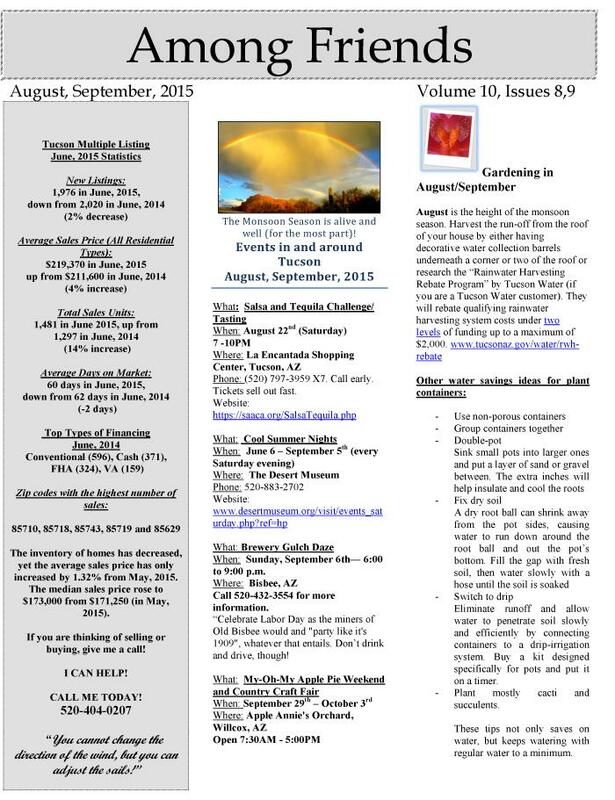 Tucson, AZ shared in this wealth and has seen tremendous growth over the last year. This growth has helped many homeowners crawl out from being underwater on their home. Underwater means you are upside down – with mortgage balances that exceed your property value. As more homeowners come out of upside down mortgages this brings more good news to the Tucson, AZ real estate market. Why? Because negative equity stops up the housing system and the economy as a whole. Read more at The Washington Post, with any luck 2016 will be just as fruitful for Tucson, AZ homeowners. The process of buying a home in Tucson, AZ can seem overwhelming and complicated. When it comes time to go to the closing table the closing can often feel rushed. Due to some changes in the mortgage process made on October 3, 2015, the stress of shopping for a Tucson, AZ mortgage will be reduced, as a new mortgage disclosure rule took effect. The new rule and disclosures ease the process of taking out a mortgage, helping you save money, and ensuring you are fully informed prior to getting to the closing table. Here is a summary of the changes in the mortgage process, from ConsumerFinance.gov. 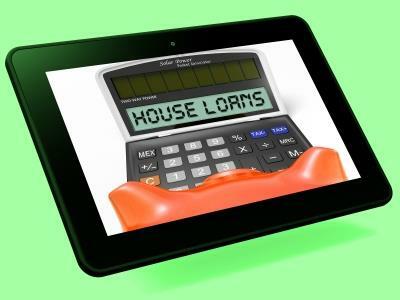 The Loan Estimate makes it easier to shop around and compare loan offers from multiple lenders. Consider applying for your Tucson, AZ loan from at least three lenders before choosing a mortgage so you can find the best deal for you. 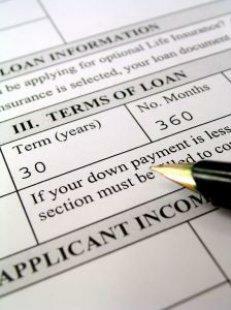 I hope that these recent changes will give you some relief while shopping for your loan. When you are ready to buy your Tucson, AZ home, contact an experienced Tucson, AZ Real Estate agent. I'm committed to providing you with the highest quality service. You deserve to have all the latest market information and the very best advice, both of which I can provide you with. I hope to speak with you soon! The trend to go green has many Tucson, AZ homeowners installing solar panels on their roof in hopes of reducing their monthly electric bills and reducing their carbon footprint. The most recent trend in solar energy is to lease your panels from one of several companies that have popped up over the last few years. Nationwide, residential solar installations are booming — up by 50 percent per year since 2012, according to the Solar Energy Industries Association. More than 600,000 homes and businesses now have on-site solar, with the fastest growth rates occurring in Maryland, Massachusetts and New York. But, when it comes time to sell your Tucson, AZ home will those leased panels boost or hamper your sale? Everybody is trying to go green so it should help, right? Think again. According to real estate industry experts those panels are more likely to hamper your sale and cause headaches at the negotiation table. Some would-be buyers balk at the idea of taking on the remaining lease or worry that the lease negotiated wasn't a good deal. If you have plans of selling your Tucson, AZ home during the duration of your lease you should be aware of the potential complexities that may occur. When it does come time to sell, make sure to contact your solar panel leasing company well in advance to learn about transfer and buyout options. That way you will be prepared come negotiation time. The Washington Post has further information about leased solar panels and how it may affect your Tucson, AZ home sale. Tucson, AZ – What is a Contingency Clause? Are you wondering what a contingency clause is? I like to think of a contingency clause as insurance. Once you find a Tucson, AZ home and make an offer, you hope everything will go smoothly; but in case it doesn’t, you have a contingency clause in place that allows you to back out of the contract without losing money. Most agreements already have a few key contingency clauses in place to protect against the bigger things—such as a lower appraisal than expected for your Tucson, AZ home—but there are contingencies that go beyond the norm. If you’re about to make an offer, consider all of your options. Home inspection: This gives the Tucson, AZ home buyer the right to order a professional home inspection and back out of the sale if major unreported damage is found. A basic offer won’t automatically contain any contingency clauses. While many Tucson, AZ real estate agents include some standard clauses in every offer, you should work with your agent to make sure you’re including contingencies for everything specific to your circumstances. Once you’ve submitted the offer, keep in mind that the seller may submit a counteroffer with his or her own contingency clauses as well. I can help walk you through your offer and any contingencies to ensure you are covered with Tucson, AZ home purchase. Please contact a Tucson, AZ real estate agent when you decide to start your home search. I'd be happy to help! Summer and its scorching hot days are here in Tucson, AZ. If you’re like most homeowners, you notice your pocketbook tends to get thinner as the temperatures rise and energy costs peak during June, July and August. However, there are some simple ways to keep your utility bills low and your bank account happy. You’ll also be doing your part to help save the environment, as it is estimated that half of the energy used in your Tucson, AZ home goes towards maintaining a comfortable temperature. Ready to save money on your cooling costs? Here are some tips and tricks to try. Keep the cool air inside. If cool air is escaping your home, you are throwing money out the window – quite literally! Make sure your window-unit air conditioners fit tightly so that cold air cannot leak back outside. If you have central air, be sure to insulate any drafty windows. Keep your filters clean. To keep your air conditioning performing at its peak, it is advised that you change your air filters once per month. Program your thermostat. If you have central air and a programmable thermostat, you can save up to 30% on your energy costs annually. Set the temperature a few degrees higher while you’re gone during the day and program the air conditioning to kick on just before you get home. Avoid using the oven. Finally, the perfect excuse not to cook tonight! Turning on the oven heats up your entire Tucson, AZ home forcing your air conditioner to work harder than it needs to. It’s time to fire up the grill and do your cooking outdoors. Turn off and unplug electronics. Even when your television or devices are in the off position, they are still sucking power out of the outlet. Unplug your electronics when you’re not using them and you’ll be surprised at the savings on your energy bill. Take these steps to lower your energy costs as the temperatures start rising and you’ll find that you have some extra cash to spend on all of the fun festivals and events going on in and around Tucson, AZ this fall. If you’re planning to buy or sell a Tucson, AZ home this fall, please let me know! Tucson, AZ – Is a Condo a Good Fit for You? The American Dream for many is to own their own home. Similar to the effort needed to make any dream come true, being a Tucson, AZ homeowner takes a lot of work. Buying a home in Tucson, AZ means committing to making any repairs needed along the way, complete with a commitment to maintenance and landscaping chores as needed. If these kinds of chores give you pause, why not consider living in a condominium instead? For some people, a condo purchase represents a stage prior to buying a traditional home; for others it is the best fit for their lives over the long term. Here are a few benefits to condo living in Tucson, AZ. Be Near the “Action”. The condominium market in the United States is growing in popularity. In bustling, artistic, urban settings condo life is ideal. Living in the midst of a city gives you access to public transportation and puts you within walking distance of shopping and dining. In a city like Tucson, AZ this means being in the beating heart of the city’s art, music and entertainment 24/7. Even in areas outside the center of the city, many buyers enjoy the security – matched with the elimination of maintenance and yard work – that condos offer. More Organized. Another advantage to condo life that might not occur to everyone is that condos typically have less square footage than similarly priced single family homes. For many condo buyers, this means making a commitment to using space wisely. For single family homeowners, it can be easy to fill room upon room of a house with items, including many that lack even sentimental value. Soon, you’re not even able to park your car in the garage anymore. But the compact coziness of some condos makes it imperative to budget your space in your Tucson, AZ condo. When you’re not filling up empty rooms, you are bound to live a cleaner, more organized life. Being a homeowner is a big decision. It’s also not for everyone. If you want fewer home maintenance tasks, or if you just prefer a simpler, more organized life, perhaps condo ownership is for you. If you are still searching for that perfect Tucson, AZ condo, let a local expert help you out. Buying a condominium is an exciting and complex adventure. I pride myself in being a local expert and would love to help you get acquainted with the city. Contact a Tucson, AZ real estate agent when you are ready! When a home lingers on the market too long, the home may be perceived by buyers as flawed or overpriced. If you tried to sell your Tucson, AZ home last season and it just sat on the market you may need to take a different approach the next time around. Starting over fresh as a “new” listing on the market, along with some other key changes, may be just what you need to get your Tucson, AZ home sold. Pricing. It may be time to reevaluate the price that you previously listed your home. It may be that times have changed and due to recent sales your home price just isn't current anymore. You may also want to get strategic about your pricing to make sure your home is seen by as many as possible. For example, instead of pricing at $355,000 price your home at $349,900 to ensure you are catching prospective buyers with property search parameters below $350,000. Whether it's staging, new photos, or a new price, avoiding the dreaded rep of a lingering listing is something every seller must consider. 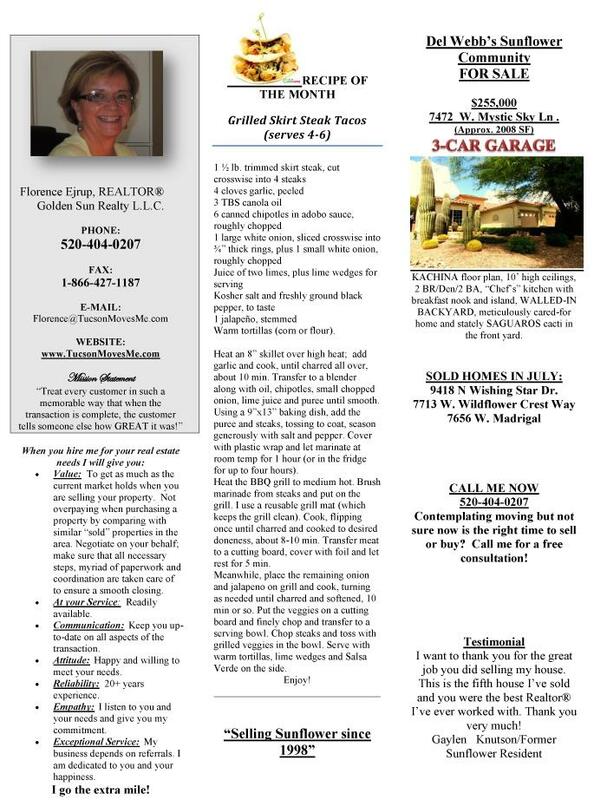 If you’re planning to sell your Tucson, AZ home, I’d be happy to help! 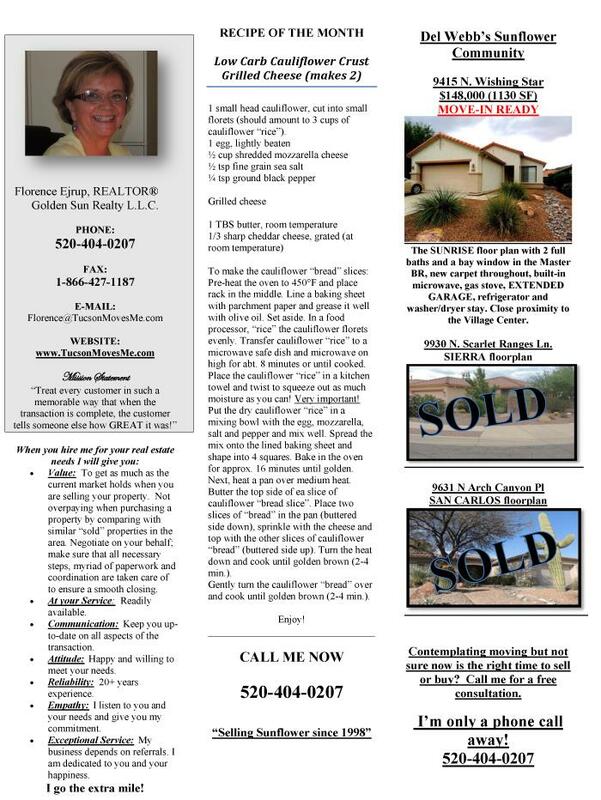 Please contact an experienced Tucson, AZ Real Estate agent to find out how to get your home sold, this time around. I look forward to hearing from you and hope to earn your business! Tucson, AZ has been one of the fastest growing communities in the country for a long time, and with good reason – the relaxed, western flavor and year-round outdoor life make it a wonderful place to live. It's no wonder Tucson, AZ is a top retirement city, it's warm in the winter, has sunshine year round, gorgeous surroundings, and ample space. 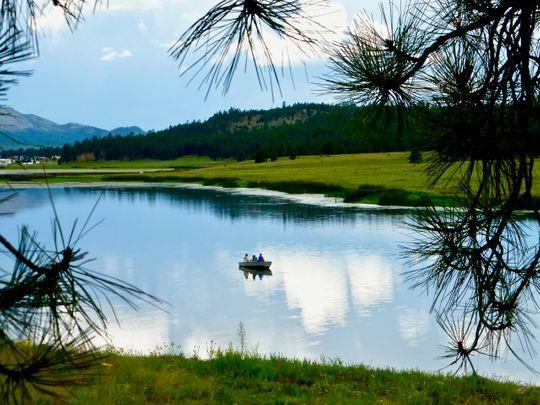 Also rated as one of America's best affordable places to retire, it is a smart move. Tucson, AZ and the surrounding communities boast a number of 55+ Communities such as the favorite, Sunflower, easily Tucson's best kept secret. Sunflower is in a stunning setting with Sombrero Peak as the backdrop. 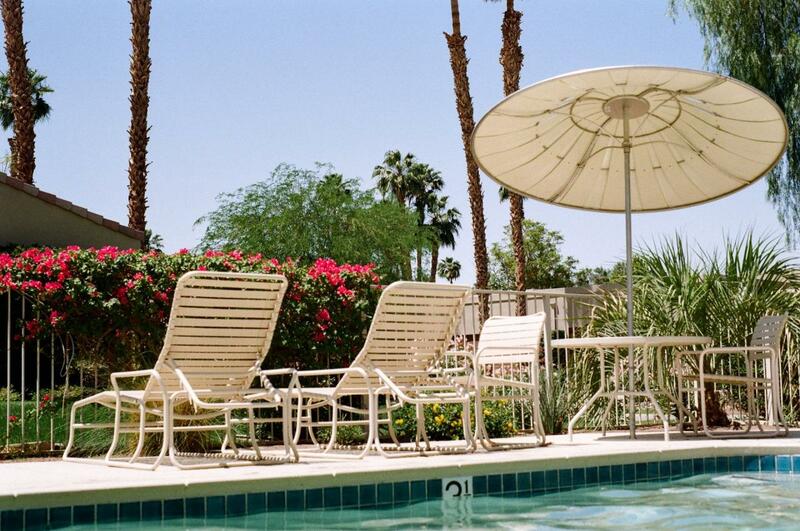 With plenty of other 55+ communities to choose from Tucson, AZ is sure to please every retiree! Why should you consider a retirement community? 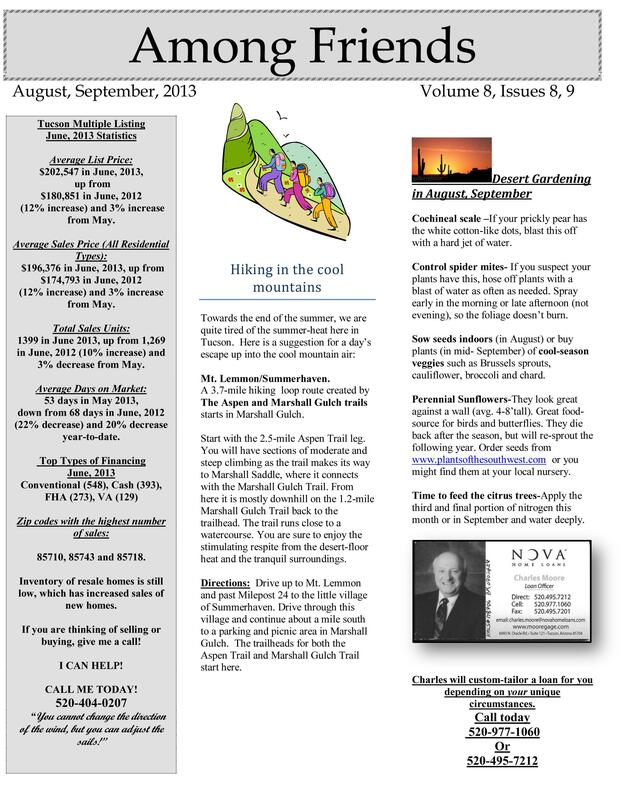 It's a great place to belong to a community of those with similar age and varied life experiences to share. Many Active Adult Communities have amenities such as swimming pools, tennis courts, fitness rooms, golf, and more. Depending on the community it can feel like living at a resort! It's a great place to meet new friends and build long lasting relationships. 'Tis the season for holiday lights, parades, and all around holiday fun. 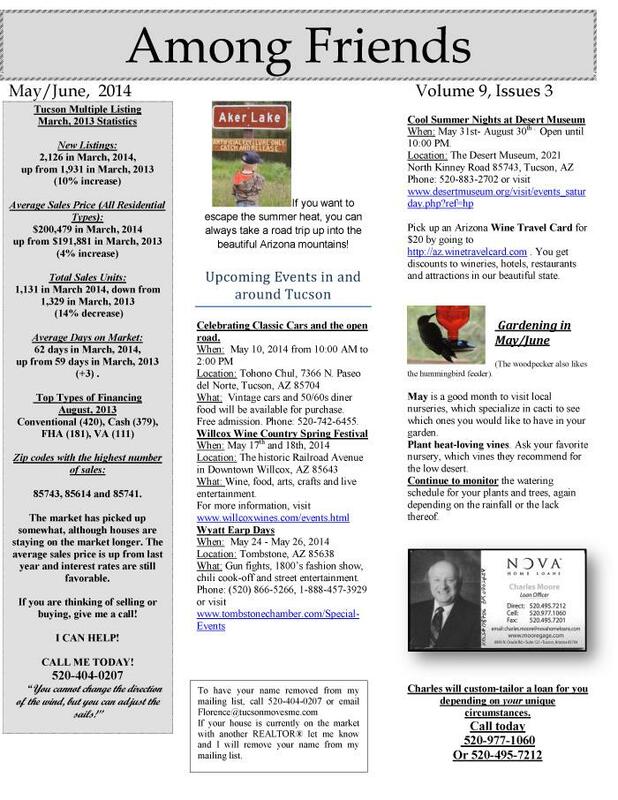 Looking for something fun to do in Tucson, AZ with friends and family in the upcoming weeks? There is way too many to list them all, but, here is a sampling of some local favorites to help keep your days merry and bright. The Nutcracker Ballet. This weekend, December 19th - 20th visit the Vail Theatre of the Arts for the 13th Annual production of Tchaikovsky's The Nutcracker Ballet. Come experience this family tradition with Ballet Ricon and featured guest artists Mark Nichols and Christer Everly. 10701 E. Mary Ann Cleveland Way, Tucson, AZ. Winterhaven Festival of Lights. 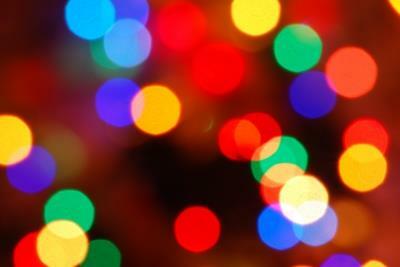 Now through December 27th, enjoy the Winterhaven Festival of Lights, in its 62nd year. Celebrate and also contribute to a good cause with the Community Food Bank in Tucson, AZ. Bring a can of food as a donation. Entrance off of Ft. Lowell and Prince, Winterhaven neighborhood. 20th Annual Downtown Parade of Lights. In it's 20th year, the Downtown Parade of Lights is sure to delight all ages. Make a day out of it with visiting Santa, shopping in downtown Tucson, AZ, and enjoying a holiday meal or treat from one of the downtown restaurants. December 20th, 17th Street/Stone Avenue, Tucson, AZ. Tucson Jazz Festival: New Year's Eve Gala. Ring in the new year at the spectacular JW Marriott Starr Pass Resort and Spa with world-renowned jazz headliners. 3800 W. Starr Pass Blvd., Tucson, AZ. I hope your holidays are merry and bright and that you get to experience all that Tucson has to offer this time of year. If you are visiting us in hopes of buying a Tucson, AZ home and need a local expert to help show you around please contact a Tucson, AZ real estate agent. I'd be happy to assist you in any way possible. Happy Holidays to you and yours! Are you planning on putting your Tucson, AZ home on the market? Many would think that once your home is listed and the for-sale sign is up that your home is all ready for would-be-buyers. But is it? Your home needs to look it's best when it comes time for showings. First impressions are everything, especially for a home on today's market. As a Tucson, AZ Real Estate agent I have seen homes in various condition and have learned what does and doesn't help a home out during a showing. Here are some of my tips for making sure that the first impression is a good one. Front landscaping and decor: Stay on top of any lawn mowing and tidy up the front landscaping. This is the first thing a potential buyer will see! A new colorful welcome mat and a potted plant outside the front door will also help spruce things up. Make sure your windows are sparkling and give your front door a fresh coat of paint. Think of it as preparing for a formal dinner party: Pretend you have guests coming over and walk through your house from room to room, removing all the clutter, ensuring that all kitchen and bathroom counter-tops and dressers are as clear as possible. Keep all closets and toys organized and remove any other excess clutter. Thoroughly clean all of your appliances, including the inside of your oven and microwave, and make sure the rest of your Tucson, AZ home has been dusted and polished. 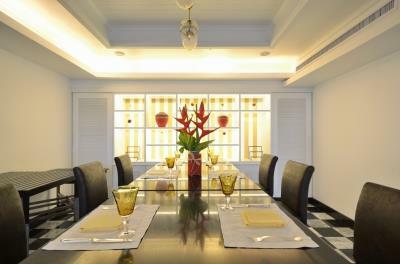 In the dining room add a beautiful centerpiece to the dining room table to add elegance to your home. Fresh flowers in the kitchen are always a beautiful touch too. Touch up: Touch up your interior paint, if necessary, and get a new coat of white on the baseboards, if needed. If you have any carpets consider getting them professionally cleaned before any buyers view your home. Also make sure that you tackle any small projects like leaky faucets or non-functioning light bulbs. Basically, use common sense when preparing your home. Your job as a home seller is to present a simple, clean, attractive home that potential buyers can picture themselves in. Whether you’ve accepted a job offer in another city or have decided to relocate, or if you are planning on retiring in Tucson, AZ, you may not know it, but, you have a need for a Tucson Real Estate agent! I understand the temptation to sell your home “For Sale By Owner.” If the sale is successful and the homeowner sells for a fair price, thousands of dollars can be saved on a real estate agent’s commission fee. However, entering the Tucson real estate market without the knowledge and negotiation skills of a professional is a task very few are prepared for! 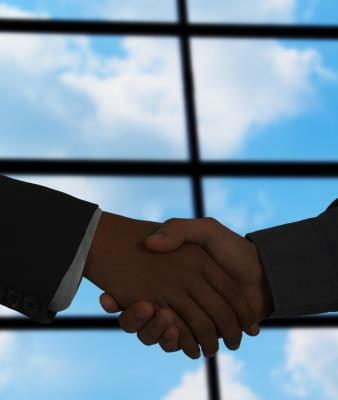 Most homebuyers will enlist the help of a buyer’s agent to negotiate and represent their best interests. While it is possible to face an army of homebuyers and their agents on your own, I always advise sellers to at least consult a professional before deciding to take full responsibility for selling your home on your own. More often than not, hiring a Tucson Real Estate agent with a deep knowledge of the local market actually saves homeowners time, money, and a major headache when all is said and done after the closing process. The same can be said for homebuyers. 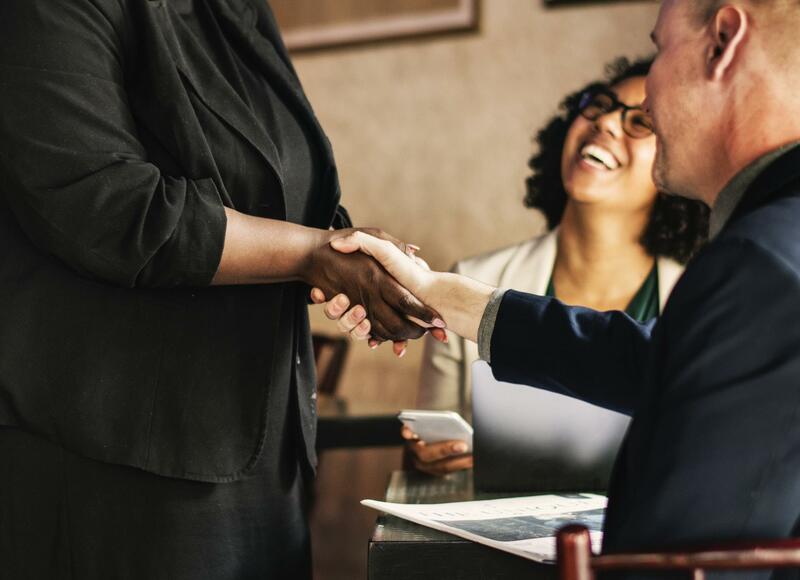 You need a trusted adviser to not only have a hand on the top of the market to guide you to the newest and most appropriate listings, but, you also need their expert negotiation skills when it comes to the deal. Referrals. Ask your family, friends, colleagues, and neighbors if they can recommend an agent. Your circle of influence will be honest with you and steer you in the right direction. Technology. Today’s top agents are constantly connected on the go whether they’re reachable by smartphone or tablet. When considering a Tucson Real Estate agent to sell your home, make sure you select a professional who embraces the latest technologies. He or she will be more likely to be quick in responding to your needs and answering important questions at a moment’s notice. Personality. While referrals and constant connectivity are important in today’s market, the fundamentals still apply. Be sure the Tucson Real Estate agent you choose to work with is someone you can get along with -- and even laugh with! Buying or selling a home can be stressful and tumultuous, but, having an agent with strong interpersonal skills will make the process enjoyable. 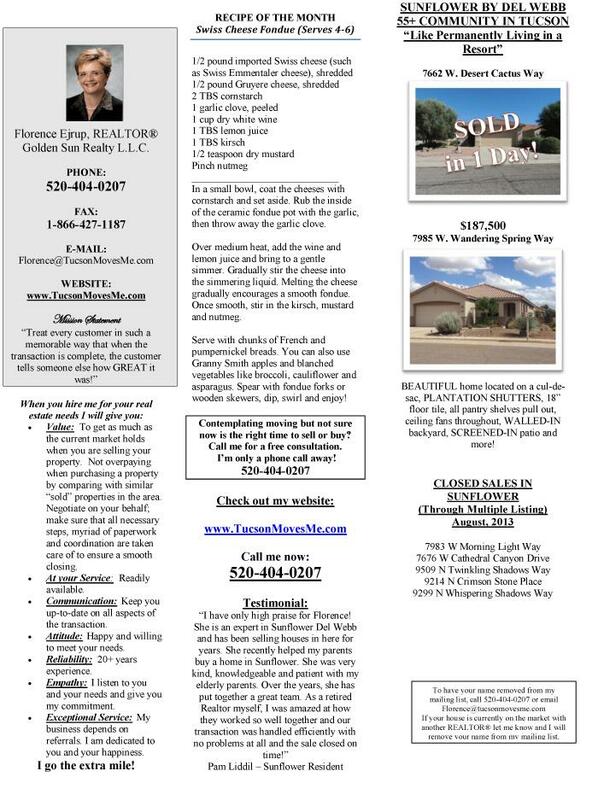 If you need any assistance with buying or selling in the Tucson, AZ area, please contact me! My proven home selling strategy has helped countless homeowners achieve successful sales, and I would love the opportunity to do the same for you. 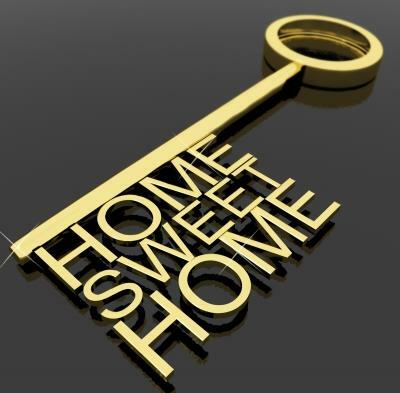 As an accomplished buyers agent I also welcome the chance to find you your dream home! Are you retired and wondering if your retirement savings is going to last? Even if you are lucky enough to have a comfortable retirement nest egg for your Tucson Retirement you may worry it might not last you the next 30 or so years of retirement. It only takes one financial disaster or medical crisis to devastate your life savings. Don't worry though, I've researched several tips to help keep your Tucson Retirement protected and hopefully help it to grow along the way. Rainy Day Fund. Some retirement planners say retirees should have from six months to a year of living expenses outside of your regular retirement account. This will give you a safety net and keep you from drawing from longer-term investment savings. Having this rainy day fund completely insulated from the stock market will help ensure it's longevity, no matter what the market may bring. Make sure your rainy day fund is not completely in cash though as there is no return after taxes and inflation on cash. Plan for Healthcare. Even if you are relatively healthy you need to plan for possibilities of catastrophic illness. If you are still working and planning to retire soon, make sure to take advantage of any health savings account. It's completely tax free – it goes in tax free, grows that way, AND is tax free when you withdraw. Downsize and Consider Relocating. Reduce your living expenses and possibly gain enough from your current home sale to add your savings. If the area you currently live in is quite expensive consider a more affordable place to retire, such as Tucson, AZ. Consider the Taxes. In every financial move you make, make sure you are considering the tax implications. Many retirees plan on living off of the interest income on their investments. The problem with that school of thought is that interest income is all taxable. You end up losing plenty of your income to taxes. Many retirees wait too long to make withdrawals from their retirement accounts to avoid the taxes. That isn't the smartest move though. Experts recommend at 60 years old to start regular withdrawals, pay the taxes, and put it in a Roth IRA. The result of that is the money growth is in the tax-free Roth and there are far less required minimum distributions starting at 70. Consider an Annuity. Turn part of your savings into lifetime stream of income with an immediate annuity. The monthly payments can offer peace of mind and also shelter you from longevity risk. The annuity will ensure a constant stream of income throughout your entire retirement. As a Tucson Real Estate agent, my services extend well beyond helping buyers and sellers through their transactions, I can also help connect you with a investment professional who can help you implement some of these above tips for your Tucson Retirement. 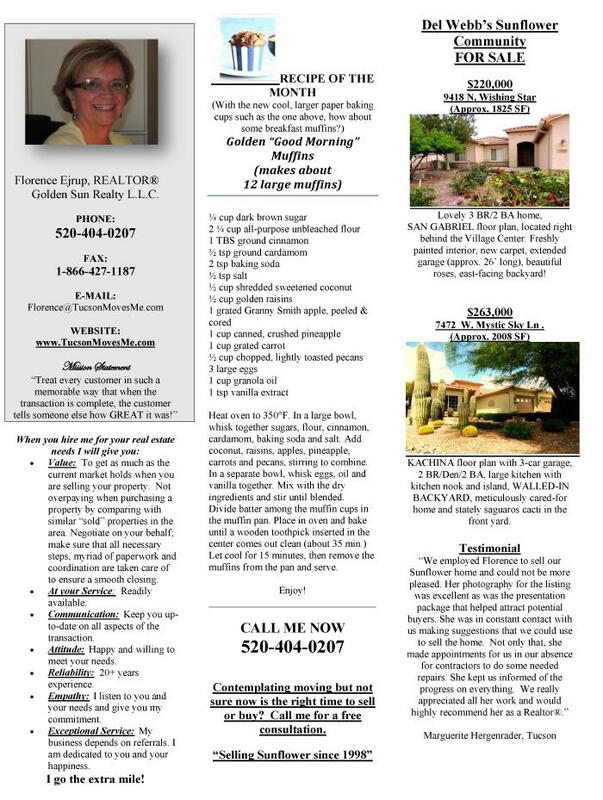 I also specialize in 55+ communities in the Tucson, AZ area and would love to help you find home of your dreams. 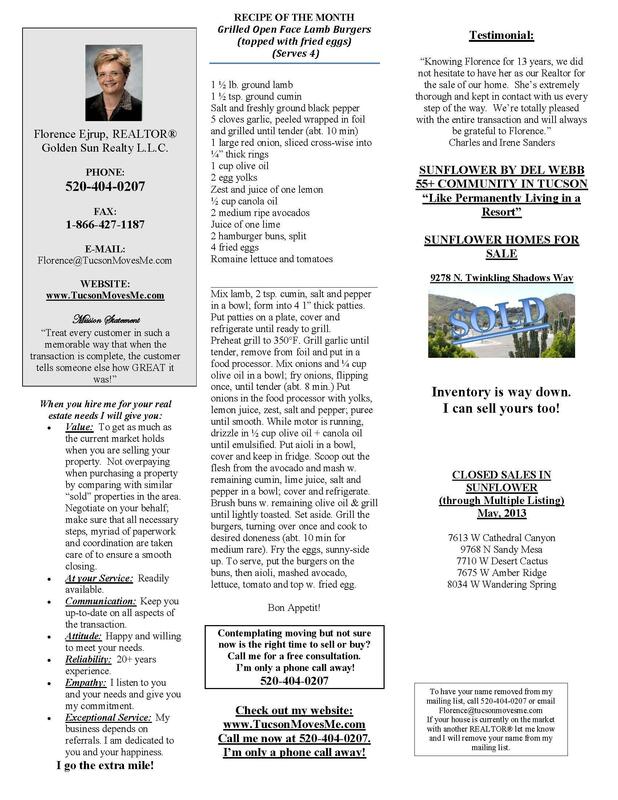 Please contact me if you are buying a home in the Tucson area or have if you have Tucson real estate to sell. I look forward to hearing from you! 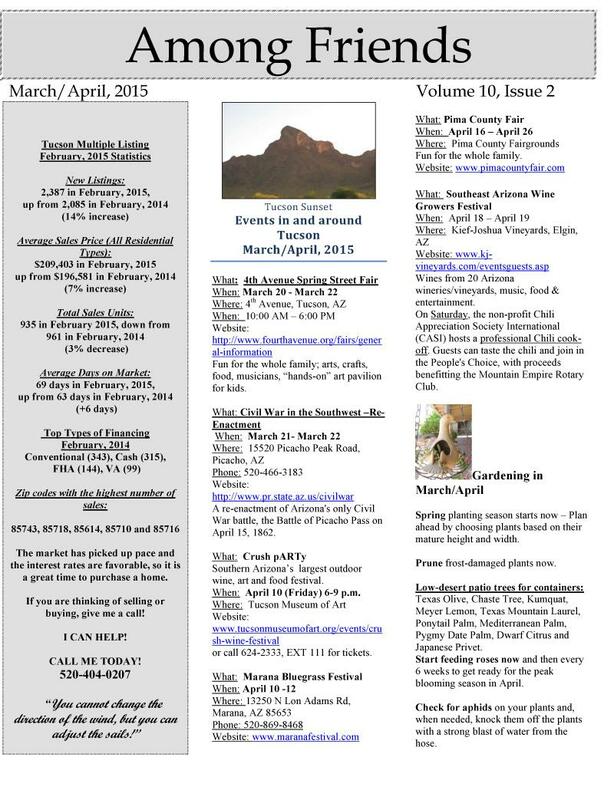 Tucson, AZ offers various entertainment this Spring for all to enjoy. 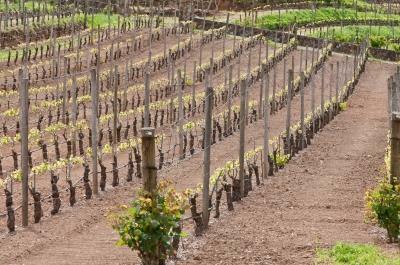 From Earth Day celebrations to wine and food festivals, there is something for everyone. I couldn't possibly list them all but here are some local favorites for you to check out, whether you are a local or visiting our fine city. At Kief-Joshua Vineyard, musicians will be performing every Saturday, from 1-4! 370 Elgin Road, Elgin, AZ 85611, very close to Tucson, AZ. As a Tucson Real Estate agent, my services extend well beyond helping buyers and sellers through their transactions. I thoroughly enjoy getting prospective residents familiar with their surroundings and exposing them to the best that Tucson, AZ has to offer. 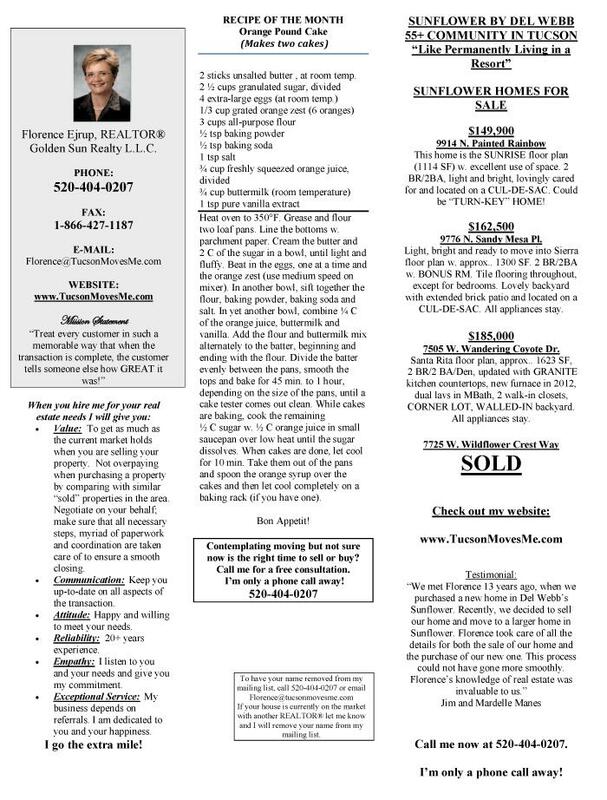 Please contact me if you are buying a home in the Tucson area or have if you have Tucson real estate to sell. I look forward to hearing from you! Selling your Tucson, AZ home is a big decision involving what is likely your biggest investment. Once it is time to take that plunge to sell there are several things that many homeowners overlook. I've compiled a list to-do's and must-do's that can help you as you prepare to sell your investment. A qualified Tucson Real Estate Professional can help you decide what your Tucson, AZ home is worth via a Comparative Market Analysis. What you have in mind might not be what today's market will bring. You might find that pricing your home a bit lower will bring excess buyer activity and keep it from sitting on the market too long and possibly even get you several offers. The longer a home sits the less likely you will get your asking price so time is of the essence. To maximize your closet space remove most of your items and neatly organize what remains. Buyers want closet space and it's hard to tell how much there is with a full closet. Clutter throughout the house should be removed as well. What a homeowner might overlook on a daily basis will stand out to a potential buyer. If you have large furniture consider putting some of it in storage to make your room sizes appear larger. Do what you can to maximize light in your home by doing simple steps like taking down drapes, cleaning the windows, and increasing wattage on your light bulbs. Do whatever you can to make your Tucson, AZ home look as bright and cheery as possible. Not everyone is a dog or a cat lover, so do what you can to remove traces of your animals by concealing/hiding the pet bowls and/or litter boxes. When it comes time for a showing make sure your pet is no where to be seen and that the home has been cleaned of all pet fur. Where possible de-personalize your home. Take a third of your stuff or more and put it in storage. Remove family photos, collections, and other personal items. 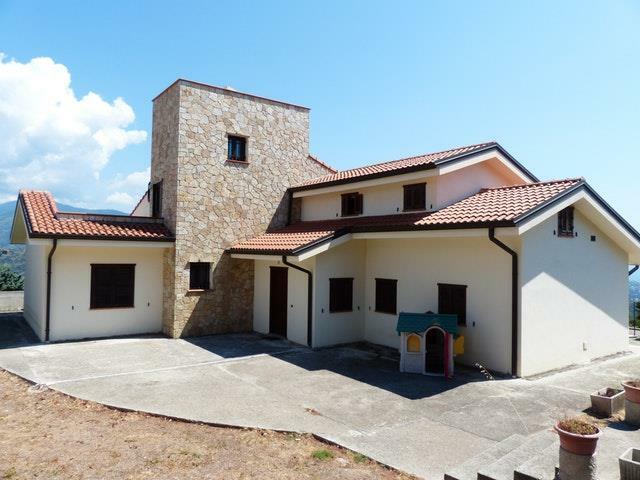 This will allow the buyer to better picture themselves living there. 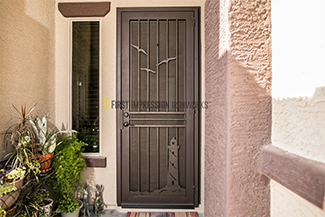 The first impression is the only impression that matters to your prospective buyers. Before they reach the fantastic interior of your home they've already judged your home by how it looks on the outside. Spruce up your exterior with new paint or simple landscaping. Your entryway is also important. Make it welcoming to those who come through it and keep that impression positive as they walk into your beautiful home. When you are ready to sell your Tucson, AZ home, look for a professional. A qualified professional is a home seller's best asset. Don't sell your home without the help of a local specialist. Contact me when you are ready. I look forward to hearing from you! 'Tis the season for holiday lights, tree-lighting ceremonies, and all around holiday fun. 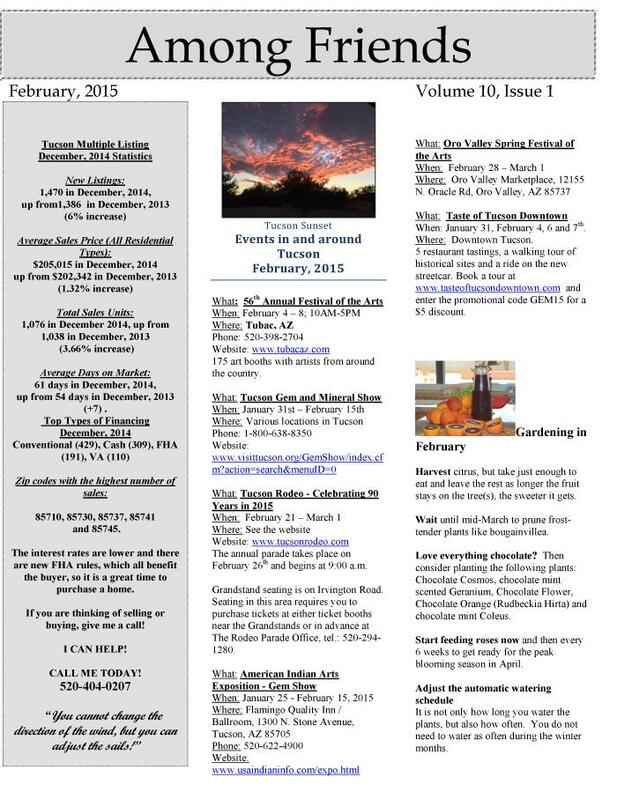 Looking for something fun to do with friends and family in the upcoming weeks around Tucson, AZ? There is way too many to list them all, but, here is a sampling of some local favorites to help keep your days merry and bright. Winterhaven Festival of Lights. 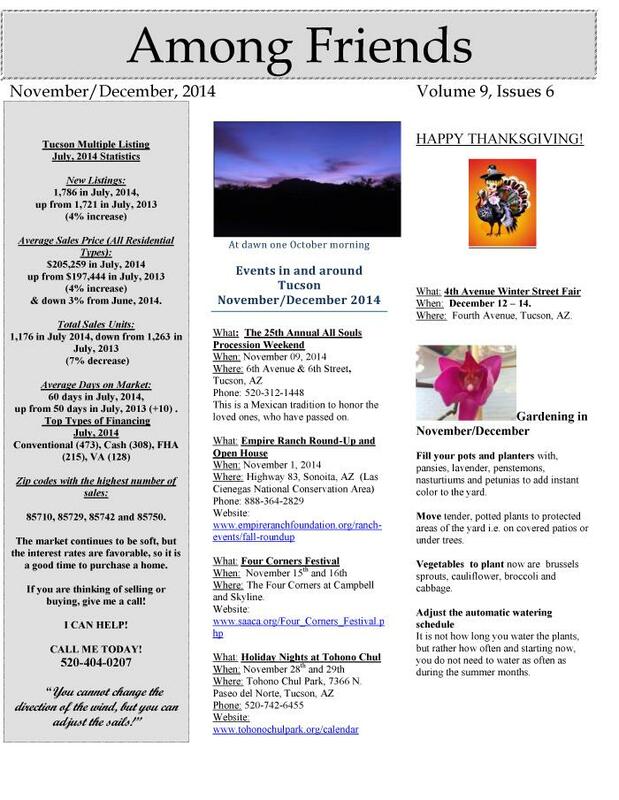 The 63rd Annual Festival of Lights takes places now through December 28th. Drive through nights are December 17th, 27th, and 28th. Join in the yearly tradition with hayrides, trolleys, and more. Entrances into the neighborhood during the Festival are off of Ft. Lowell and Prince. This free event is a fundraiser for the Tucson Community Food Bank. Please consider bringing canned food or making a donation. Parade of Lights. The Downtown Tucson Partnership along with St. Mary's Hospital proudly presents the 19th Annual Downtown Parade of Lights this Saturday, December 21st. Enjoy the day downtown with a visit to Santa Claus, shopping, or enjoying a local treat. Horse-drawn carriage tours will also be available with Santa Claus! 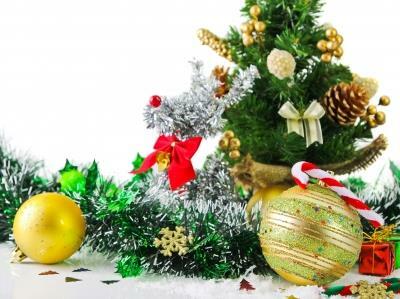 At 5:30pm join in the fun with the Holiday Tree Lighting at Armory Park just before the parade at 6:30pm. Zoo Lights. Reid Park Zoo is having it's annual Zoo Lights event, now through December 23rd. Jingle bells, 1000s of sparkling bulbs, snow, and Santa are sure to put you in the holiday spirit. I hope your holidays are merry and bright and that you get to experience all that Tucson has to offer this time of year. If you are visiting Tucson, AZ in hopes of buying a Tucson home and need a local expert to help show you around please contact me. I'd be happy to assist you in any way possible. Happy Holidays to you and yours! 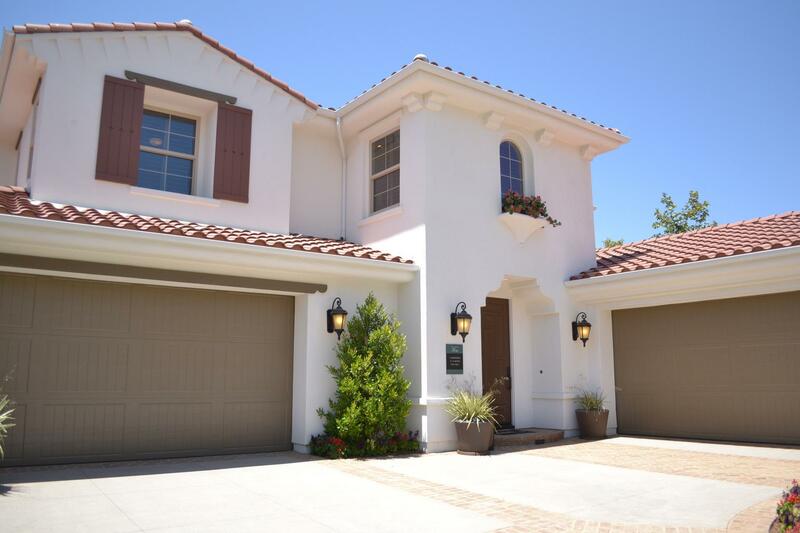 Have you already found your perfect Tucson Home? 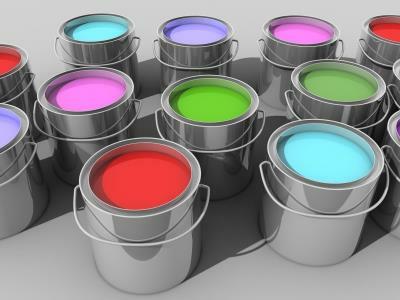 Chances are your new home doesn't have wall colors that you love or might need some fresh paint on the walls. If you're not sure where to start with this project, then read on. Start Small. Pick an accent wall or a small space such as a bathroom and add a splash of color. For inspiration look at your belongings, what color speaks to you? Select a favorite color and go with it. Since it's a small space if you don't love it, its quick to change. Hopefully you will love it and can move on personalizing your home. Mood. When selecting a color for a particular room think about mood. Do you want your bedroom to be soft and soothing or do you want some drama? Pick a cool neutral for a soothing place to rest or go for a stronger color to lay on some drama in your Tucson Home. Consider the Lighting. 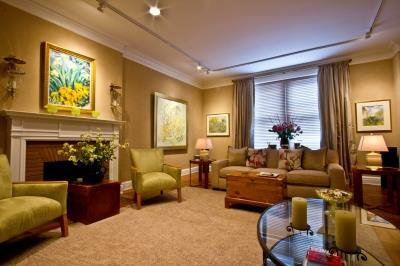 Depending on the lighting in the room your paint color can change in hue. Consider the lighting in your Tucson Home before committing to a new color. Many paint stores have light boxes so you can visualize the color in either natural daylight, incandescent light, or fluorescent lighting. When you are in one room you usually can see a peek of the next room over. Make sure that rooms that are adjacent to each other flow nicely from color to color. Don't pick colors that clash or create too much of an eyesore when together. If you feel challenged and can’t quite nail a color palette that works with your taste and preferences, enlist the help of a professional. As a Tucson real estate agent, I can recommend some interior decorators in the area who can give you their professional opinions on how to make each room in your home sophisticated and livable. 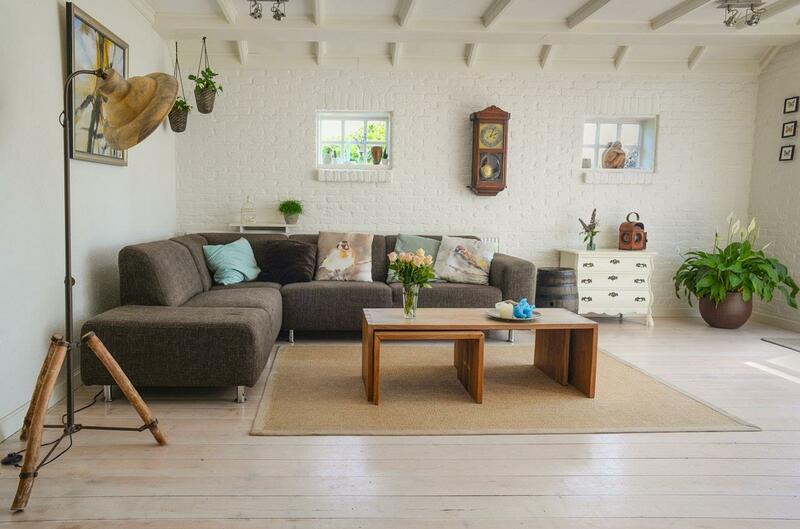 Along the same lines, an interior decorator comes in handy if you’re planning to sell your Tucson home and want to make it as appealing as possible to potential buyers. Please reach out if you need any assistance! Apple Annie's has several Fall activities for great fun. 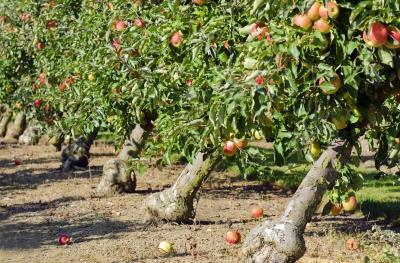 Coming up this weekend is the Apple Harvest Celebration, September 14th-15th from 7:30am-5:00pm. Celebrate the peak of apple season with pick your own apples, “All you can eat” pancake breakfasts, apple-smoked burger lunches, and wagon rides. The following weekend, September 21st-22nd from 7:30am-5:00pm is the My-Oh-My Apple Pie Weekend and Country Craft Fair, a celebration of all things Apple Pie! You can also pick your own apples and enjoy the wagon rides. Pumpkin picking also starts that same weekend and continues through October. Located at 2081 W. Hardy Road, Willcox, AZ 85643, not too far from Tucson, AZ. Kief-Joshua Vineyards is featuring, Chris Jamison, a contemporary-folk singer/songwriter from Austin Texas on November 17th, 1pm-4pm. Sip some delicious wine and enjoy the music along with that spectacular view. Coming up in October is the Willcox Wine Country Festival, Oct. 19th-20th, featuring Kief-Joshua Vineyards wine and several other local wineries. A two day fun filled event at historic Railroad Park in downtown Willcox, just an hour's drive east of Tucson, AZ. The perfect weekend getaway!